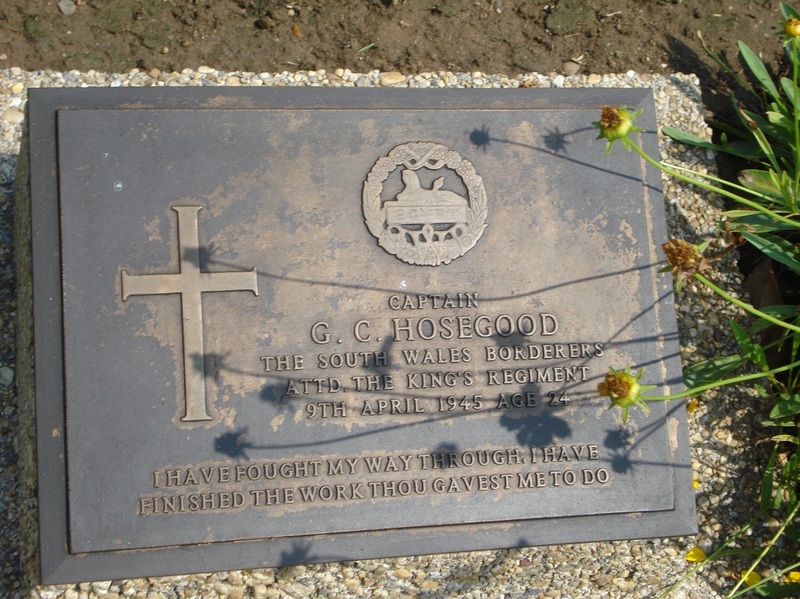 Graham Cowell Hosegood was born in October 1920 in Penarth, South Wales. It seems to me that during his sadly short life of 24 years, he never failed to impress all those he walked amongst. He received his call-up papers on 03/09/1939 and whilst attending his first Officer Cadet Training his C/O had this to say about him: “ Very Good. He (Hosegood) has a definite love of leadership, with a strong and refreshing layer of common sense." He was commissioned into the South Wales Borderer’s with the service number 134273 in June 1940, but his time with this regiment was to be short. Less than one month later he was transferred into the newly formed 13th battalion of the King’s Liverpool Regiment at the Jordan Hill barracks in Glasgow. After performing the role of coastal defence, along the shores of Eastern England, in late 1941 the battalion were given orders to prepare for overseas duties in India. Graham and the battalion boarded the troopship ‘Oronsay' at Liverpool and began their 6 week voyage to the sub-continent. I am going to let Graham tell his own story in this section in the form of his letters and correspondence home during WW2. 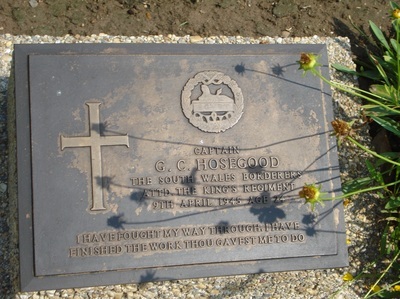 My thanks must go here to Liz Hosegood and her family for allowing me to reproduce Graham's Chindit story in this unique way. It does seem funny not getting your letters regularly and of course so far I have had none from home, although I expect several are on the way by now. I do hope that this will be a nice surprise for you all when it arrives, which I hope will not be too far hence. I can imagine you going to the door one morning and finding it there and there will be great excitement. I hope Joy won’t miss any trains to hear any news. I am afraid I have got rather on the ramble already and I do hope you will excuse me. I will start by describing my surroundings; it is just 8.15 pm and I have just come up from the dining room where I have had an excellent meal and am now at a little desk in my cabin. The doors out into the corridors are all open, the porthole is open (we have special blackout covers for the portholes so that we can get some air in) and the fan is going just up above my head. I have my tropical shorts and shirt on and no tie. I hope you got my last few letters from England all right and found them not too dull!! We started off in a nasty misty, wet day and all looked most uninviting. We spent several nights in our clothes just in case anything happened, but so far we have had a very uneventful voyage. The first 4 or 5 days have all the stewards in their nice white jackets, small tables for about 5 or 6, all the best cutlery & table clothes etc., etc. Each meal we have a menu, dated and beautifully typed. There are always 3 or 4 choices for each course, and just to let you know something what the food is like here is an example of what I have. Bacon, egg & sausage or haddock, herring or kipper, toast, BUTTER, marmalade and rolls and tea. A pudding, cheese & coffee. Tea is very light, a few cakes & bread & butter. 3, Duck, chicken, beef, lamb or sweetbreads & 3 vegetables. Not too bad I think you will agree. We have oranges, apples, butter, cheese, fish & meat everyday. I can assure you we are all thoroughly enjoying ourselves. I mentioned before we left that there were 4 of us in this cabin; it is a real beauty and we are extremely lucky having our own bathroom as we don’t have to queue up every time we want a bath. The cabin is on the port side, D Deck and in the centre. As I said before it is one of the best suites on board. The last few days have been really wonderful. The sea is as calm as a millpond and as blue as can be, just like in 1937. The sunsets are a magnificent sight; the sky is always a lovely red and it reminds me of being on the farm in summer looking out over the wheat fields. It is hard to believe that you will be in the middle of winter with rain, mist, and dark nights beginning at 4 o’clock and going on till 8 in the morning. I do not hope it is not too cold at home and that you aren’t getting any air raids. It is funny but here most of us have lost touch almost completely with what is happening all over the world. There are quite a number of loudspeakers all over the ship and they broadcast the overseas news from London 3 or 4 times everyday. Sometimes we don’t. It all depends if we can be bothered to be there at the right time. From what I gather though the Russians are doing well & we seem to have bucked up again in Libya. I wonder what you all think of having America & Japan in the war? We are having a very easy time and are all thoroughly enjoying ourselves. Bill & I were only saying yesterday we wouldn’t mind doing this until the end of the war, as it was so pleasant. We get up at about 7, soon after the steward had brought us our early cup of tea and then we go up onto the top deck in the sun, and just stroll up and down until breakfast at 8.45. There are a lot of officers & our batch is the second sitting at all meals. After breakfast we wonder out to our parade deck where all the men are at about 9.45. We wait about there for half an hour or so while the inspection is going on down in the men's deck by the captain & then perhaps do a little PT. The men have there dinner at 12 so we are then free until 1.30 when we have our lunch. After that nothing else happens and we either go to sleep or go & sit up in the sun until tea at 4.30. We have our dinner at 7.30. Actually this week I have been what is called Men's Deck Officer, and you have to see that the men get their meals all right, and be there when the captain inspects the coys sleeping area. The men are not as well off as us; they sleep, eat & live generally all in one place; they are very cramped as well & have hammocks which at first they found very strange. However, they are thoroughly enjoying themselves as well and have never had such good food before. We have to go very carefully with our fresh water as we are not the only ones here & it has got to go round a long way. The baths are salt water ones. Unfortunately we have no swimming baths onboard. This last week all the officers have been very busy censoring letters. We get 40 or 50 each to do most days and it takes several hours at a time. Now that the hot weather has come on we are drinking a lot of lime juice and orangeade and I suppose most of us are drinking 5 or 6 Pints everyday!! I do hope you are all well and although this won’t reach you in time for Xmas I will again send you all the very best and hope you will have had a very happy one. I am keeping very well and am getting brown already, but I am making certain I don’t get too much of this hot sun. Do look after yourselves very well and I am longing for your letters. I hope to be able to send another one off myself fairly soon. There are some Hindustani classes being given on board and several of us are going along too them. We get about 3 lessons a week but so far we have only had 1 lesson. We have got a very good concert party on board form amongst the troops and they give us some good entertainment. The ship also plays gramophone records, which are relayed by the loudspeakers so we have some music as well. Joan will be quite a big girl when I get back and John will be at school I suppose. I wonder how long it will be until it is all over. Well there is not much more now, as I have exhausted all my news. Again all the very best, and I only wish you could be enjoying the sunshine here too. Hope little Sam's itching is quite better. Am off to bed now, so God bless & all the best. With ever & ever so much love to all. Below is a photograph of the 13th King's officers aboard the troopship Oronsay taken in early 1942. Graham is front row fourth from the right as we look. ​The next letter is dated 24/01/1942 and describes amongst other things the battalion's stay over in Durban and how well treated they were by the locals. As with all the letters used, I have left the narrative exactly as it was written at the time. You may notice that the name Durban does not actually feature in the letter, this I would presume is down to Army censorship of sensitive information. Well here I am starting my third letter to you and we are still on the sea. I am writing this, at the moment at any rate, up on one of the top decks in the sunshine. We are back once more in what in this part of the world is winter but to all of us it is still much warmer than we ever get at home. During the hours of between about 9-4 you daren’t get out too much in the open without your topee on. As I think I have said in one of my letters before we don’t generally write our letters much before we get into port and this will be my last letter from on board. We have had quite a lot of experiences since my last letter and have had a very, very good time. We spent several very good days ashore and saw all kinds of interesting things. We arrived soon after 7a.m and the town from the sea looked wonderful, the sun was shining and a morning mist was just rising. We could see all kinds of big white skyscrapers near the sea front while a little way behind on small hills, something like those surrounding Cardiff were all the residential houses. After we had docked we at last got off our ship and were put into trains, which took us out to a rest camp a few miles away. It was wonderful to be on land again and the few nights ashore were grand. I had a tent to myself and we were provided with beds, sheets, mattresses & blankets etc. To get into the town there were two methods. The first was by train and the second by taxi. We went by the taxi the whole time as the trains were so frightfully packed and it was a case of fighting for a place & then most likely having to stand. The taxi used to cost about 7/6 - 10/- a time but with the 4 or 5 of us in at a time it didn’t come to very much each. At night time it was lovely getting back to the camp and getting into bed with a little hurricane lamp. This wasn’t really necessary as there were hundreds of electric lights outside which lit the whole place up beautifully. The noise of the crickets was terrific and reminded me of the noise they used to make at night when we were at the Warren. The town itself was magnificent very modern with these skyscrapers, big wide streets and huge shops. The majority of the people were white but there were a lot of natives as well. Really it seemed extremely English in the ways and manners of the people, but it looked like one of the lovely American towns you see on the films. The white people never mixed with the black, each having their own shopping areas, their own part of the beach to bathe on, their own public lavatories and the blacks never entering the hotels. The people were extremely kind to us all and our men were well looked after. Our ‘little bunch’ were also lucky as on of Brian’s aunts lived there and gave us a very good time. One afternoon she took us out in her car to a little bathing beach about 15 miles away. We had a grand bathe and then a good tea of ice cream, scones, cream, jam, cakes and tea. We had several meals at her house and from her balcony you looked right out over the town and across the bay and the lights were so wonderful I can’t describe how grand it was. We were not with her the whole time and did a lot of wandering on our own. We had several dinners at a hotel right on the front; the food was not rationed in any way and you got a full 9-course meal for 6/6. The fruit we had was delicious. There were peaches, bananas, oranges and about 6 varieties of their own fruit the names of which I am afraid I don’t remember. Sunday In the hotels all the waiters were black and we found out from Brian’s aunt that instead of having white maids, nearly everyone used to keep 2 black boys; one as the cook, the other for the housework. I must say I didn’t fancy it very much although we would get used to it after a time. We were allowed to travel on the buses and trams for nothing and all the cinema and theatre tickets were reduced for us. Actually I wasn’t at one cinema!! I would like to have seen a bit more of the surrounding country but unfortunately there wasn’t time. I have got quite a lot of photographs of the place, that I bought, but am unable to send them on yet at any rate, on account of censorship. At last it was time to pack up and get back to the ship. I don’t know why but we had to change our ship and this time we got onto one which in peace time is a lovely ship, but which had been knocked about so much as a trooper that inside she was almost disgusting. We were packed very tight. However, we set sail and had more or less made up our minds to make the best of things. When suddenly after only a few hours out we turned round and headed straight back into port. We were all delighted and thought we would get a few more days leave as we found that something had gone wrong with one of the engines. However, next morning we were put onto another ship and we left the same evening. This one is a real beauty: very modern and extremely comfortable. I think the Broomfields would be interested. The cabins are really huge and although there are 7 of us in my cabin we are very well off. There is Bill, Brian, Leslie, Blackburne, Neville & another boy called Freddie Jones. The food is I think a bit better even than our original ship. We have plenty of deck space where we can lounge about in deck chairs and play deck games, and there is also a wonderful open air swimming pool where we all spend as much time as we can. We only get certain times to go in as there are so many that want to use it. The water is changed twice every day and when we get it, it is always just fresh. I do hope that you will have received the cablegram; please excuse the rather weird wording but you had to choose a few phrases that were laid down. It was done with groups of figures, and what I sent was 3 groups which cost me 2/6. I also hope that the stockings I sent Joy will have reached you by the time you get this. I only hope they will fit one of you. You may be able to swank off to Joan & Maureen with some real silk stockings!! I also sent 3 prs to Mary and a cablegram too. I shall send another cable as soon as we get settled in. The first one I sent would be delayed a couple of weeks I expect, so that we should be well away from the place & the enemy get no chance to find us. I don’t know but I rather expect that sometime or other you will get a letter from Brian’s aunt, just letting you know that she saw us. We are still getting most perfect weather and all of us are extremely well. I have got very brown but am not letting the sun get on my body. By gradual stages my arms and legs are now lovely & brown. I thought of Joy a lot last Friday and do hope she had a lovely birthday. I do so wonder what you all did? I am also going to wish Daddy a very, very happy birthday as well. I hope it will reach you in time. I think it will. We get overseas news regularly form London and I hope the raids in the S.W. Have not been anywhere near you. It is no good asking you anything about what you think of the war, because by the time this reaches you, the present day news will be so out of date. At the moment, however, just to give the latest news I will mention that during the week the Russians retook the town of Mozjaisk on the Moscow front. I can’t say yet whether I shall have a chance of seeing Maureen’s people, but if I do I will let them know that she is still about’!! We have had no rough weather except for those first few days out from England, and the last few weeks you couldn’t tell you were moving unless you are actually watching the sea. There is no vibration or anything like that. We have seen some lovely sunsets as well and I only wish I could have taken some photos of them. A lot of the people are getting tired of seeing nothing but water and as I said before I should love to see some nice grass fields and all the big oak trees down Westbourne Road. I do so wonder if you have had any snow; it seems incredible to think of such a thing. I hope little Sam is very well & I suppose he still sits on the backdoor step barking furiously at the balloons. I don’t know whether I shall, but I am hoping to learn to ride a horse & play tennis reasonably well while I am away. I have some idea of bridge but won’t join any bridge clubs. Some people have done nothing but play bridge ever since we left home. I am sorry but I haven’t been able to get the snaps I was hoping to send you developed yet, so they will have to wait a bit longer. We have had no letters from home yet but are hoping it won’t be long now until we get something I am longing to hear how you all are and all the news. Once we get settled in I shall write every week. Please give my love to all the necessaries including Mrs Caryl. There is no more news now so shall have to close. Take no notice of the 'On Active Service' on the front. I honestly don’t know why it is there, but it is a rule & there we are. Well look after all your little selves and God bless you all, ever, ever so much. I expect it will interest you to know I don’t forget my prayers. So for this time goodbye. With tons & tons & tons & tons of love to all. From Graham. P.S Of course I have written to Mary, but any special news will you let her know. Here I am at long last in India and we have now settled down and are all very comfy. We have been here just a week now having arrived about 11p.m a week yesterday. We got off the ship on the Friday morning. 30th of Jan, and left Bombay the same evening in the train. We spent the one night in the train and altogether we were 26 hours travelling. We came over miles and miles of plain that all seemed to be the same but it was very interesting at the little stations seeing all the Indians; the train was nothing like as comfy as those at home but they were a lot better than we imagined. The stations were nothing like as large as most at home and for most of the way there was only one line. However, for the first 100 miles or so the line was all electric so they are well advanced. The steam engine, after the electric, brought us along at about 50 for most of the way so we were not going very slowly; as fast as a lot of English trains in fact. Here we are in what is called a cantonment; it is really just a big military camp a few miles out of Secunderabad, actually 1½ I think. We have one area with our barracks covering an area of a couple of square miles & then other units have barracks similar to us. The men have lovely big buildings in which to live, and the officers are well provided for as well. All the subalterns have a large building to themselves, a bungalow it is called, as there is no upstairs in India, at any rate in this part, and this is split up so that 2 of us have 2 rooms between us. I am in with Blackie and one room is our bedroom, the other our lounge. We have a third which is our bathroom & lavatory as well. Just a rough birds eye view of the bungalow. The rooms are provided with big electric fans and we have good electric lights. The washing arrangements are very primitive; we bath in a big bath like you use at home in the wash house and wash in little bowls like you wash up in. However, there is an ample supply of hot water so we are all right. The water is heated on little fires out in the open just behind our bungalow. Then the lavatory is just a pan affair which the sweepers empty every time. These sweepers do very little else and are all women. Each officer has a bearer. He is the equivalent of the batman and does all the housework side of things. We are all getting very spoilt, as they won’t even let us take our boots off ourselves. They also wait on their own masters at meals. We have all had to buy a little tea set for our early morning tea as they would never dream of us having it just out of an ordinary mug. Our clothes are sent to be washed as soon as we take them off. There is a special man who does that and we are all wondering how long our clothes are going to last as the washing is done by hitting the clothes on stones and not rubbing in the ordinary way. We are feeding extremely well in the mess and I am only so sorry you can’t all be here as well. Life is extremely pleasant; at the moment I am working in the Orderly Room with the Adjutant, as there is very little Intelligence work. We work till about 4 p.m and then go back to our rooms where our bearers have a cup of tea waiting for us. After that we go down to the club and play tennis, swim, or squash. We have all joined the club as it has all sports facilities and without it we should get little or no exercise. This is a real peacetime India and no one seems to be working on a wartime basis. We are here from what we can see on garrison duties which entails nothing special. At this time of year the weather is very pleasant. Just like a nice hot summers day at home, but the end of March, April & May are really hot I believe. Then in June & July we get the monsoons. There is no blackout here and it is glorious to see all the lights twinkling away in the distance. Hyderabad is only about 4 miles away and we can see the lights from there very easily. We all like the Indian people round here. They are kind and very willing. We get all kinds of men up on the veranda selling all kinds of things. I bought a tennis racket from one and am hoping to be quite good at it when I return. Down in Secunderabad there are some quite good shops 3 or 4 cinemas an banks, post offices etc: We have all hired push bikes and go round everywhere on them. I have a good one and pay 8 rupees a month for it. 1 rupee is worth about 1/6 in English money. We are gradually getting used to rupees and annas but the first few days were very awkward. Our bearer is an ordinary civilian whom we take on like a maid, & he is our own, the army having no ruling over him. We all pay our bearers 30 rupees a month. Things are apt to be a bit expensive sometimes, but I shall manage very nicely. The married subalterns are going to find it a bit hard I think. I am very well and have been swimming every evening for the last week. I haven’t found it a bit too hot yet. I do so wonder how you all are. You seem to be having a very cold winter; I do hope it is not affecting any of you. I also hope you are getting nice peaceful nights and are not getting any raids. We had a very enjoyable journey out here and I am glad to say that as far as I know it was without incident. We are all quite pleased to be on land again and have a bit more room to move about in, and also I find it lovely to have all my cases unpacked and be able to find my clothes easily. I shall write a letter every week and send it by the ordinary way; they have just began Airgraph letters, and shall do my best to get one of those off every week as well. We are all longing to get our first batch of letters; I expect it will be about another month before we get any. I do hope you have had some of mine already. I forgot exactly what number my last letter was. I believe it was no.4, so shall call this 5. Once more I hope Daddy will have a lovely birthday and very, very, many happy returns. I hope it won’t be many birthdays till we are all together again. With tons & tons & tons & tons of love to all, from Graham. My airgraph went off to you yesterday saying that I had had your first. It was a lovely surprise too, but I hope you will write just as many letters as I expect you fell that there is nothing quite like a real letter. The airmail P.C’s are just about as quick evidently as the airgraphs because yours of the 20th May got here in just about three weeks. I can’t tell you how glad we are to have this cooler weather and to see clouds and rain. I do wonder what kind of a summer you are having; I hope it will be a nice fine one like this time last year. We are having to take macs everywhere with us and for the time being our topees have been put away and our English hats have been brought out. Looking back, though, over the hot months it really wasn’t too bad and it hadn’t troubled me in any way. Some of the Bn, though, have had what is called prickly heat. They are little spots which prickle terribly and you can get covered with them. I have been very lucky and only get it a bit on my forehead but Brian and several other officers alone have had on awful time with it, all over them. We think we are off to our new station sometime at the end of the week and there is all the bother of packing again. We can’t take nearly all our stuff, only 135lbs. The rest is going to be locked up where no body will be able to touch it until after the war. It will stay here, while we with our little bit may go anywhere. I am taking my valise and one tin trunk with me, while, I shall have to leave here my other tin trunk, my suitcase, golf clubs and one other tin trunk that I have bought out here. It’s a nuisance getting you belongings all in different places but still we can only hope we shall see it again. We are beginning to get a little bit separated at the moment. Leslie Cottrell has been told that he has got to be ready to move overseas, as they call it, at anytime. He hasn’t the slightest idea where he will be going or what he will be doing. Neville Randall and on other officer are staying here because they aren’t very strong and won’t be able to stand our new training & two other officers are away to other jobs. That means that two of our little gang are going. Now we only have Brian, Bill and myself. Then there is still Blackie but he is a lot older than the rest of us. On Friday night Bill, Neville & I were down at Mr Groves for dinner. We had a very good meal and then sat and listened to some lovely gramophone records. It was a very quiet but thoroughly enjoyable evening. These last few evenings, since the rain started, we have had hundreds and hundreds of flying ants, I suppose you would call them, but much bigger than an ordinary ant. They are more the size of flies but with very much bigger wings. At any rate these things flutter round and round the lights and then their wings come off and you have all these horrid things crawling about the place. They have been a beastly nuisance, but we are told they are only about for 3 or 4 evenings and then you don’t see them again. I expect Pop used to get such things in W. Africa. We haven’t had any letters this last week, and there is very little news. You will already have heard the Duke of Gloucester had been here for a short time. You may have heard on the news he was in Hyderabad. He hasn’t been up to the barracks here, but we saw his plane go over us yesterday on its way to the aerodrome. I have been out on a couple of route marches this week and the other morning I took the company 12 miles. Fancy me doing that a few years ago! I wasn’t tired or anything after it either! Last Monday evening we had a final guest night in the mess. It was quite a noisy business but I thoroughly enjoyed it. We had a good dinner, then we had some sing songs and finally ended up by throwing all the furniture out of the windows. I don’t suppose we shall have another party like that for sometime now as we shall be in tents and not eating nearly as well. There seems to be a lot of talk about opening a second front at the moment. I wonder if anything will come of it? Out here things are getting very much stringer. We had our church parade this morning. It will be the last one here, and sometime within the next few days we shall have tog o round & say goodbye to the few people we know. I do hope you are all very, very, very well. I am fine. Give my love to Mrs Davidson, Caryl, Morel etc. & I hope all are well. Has Malcolm Newton got here already? If you can get their addresses please let me have them & it might be poss to see them sometime. We hope to have some leave in about 3 months time, after some of our training. This is a very uninteresting letter I’m afraid, but there is no real news. Am off for my lunch now, so for the time being God bless. May not have time to write next Sunday. Very much love to Auntie Mary & all. With tons & tons & tons & tons of love from Graham. Pictured here on the left is a photo of Graham in India, probably Secunderabad. 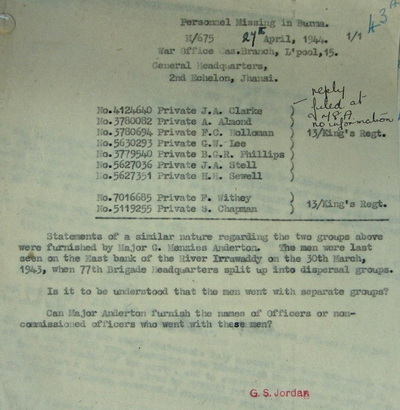 The next correspondence is an Airgraph that continues his explanation of Chindit training. 13th Bn, The King’s Regt. C/O Patharia Camp Post Office, Patharia. India. My very Dear Mum, Dad, Joy & Sam. On the 14th August Graham writes home and mentions in his letter the terrible drownings of CSM Bateman and Privates McKibben and Marsh, the full story of this tragic incident can be found on the Voyage and Training pages. My very dear Mum, Dad, Joy, and Sam. It is a long time since I have been able to write you a letter but I hope you have been getting my weekly airgraphs and I know you will understand the difficulties we have had for letter writing. We are in Saugor, a small town about 30 miles from our actual camp, doing one stage of our training. It is heavenly to have a proper roof over our heads once more and to be able to get a hot bath in the evening. We have got a proper mess going here; in the jungle we live in company messes and very rarely see officers not in our own companies (columns - crossed out). However, we are all together here and are very comfy. We have a wireless and what a change it is to hear some music and get some news. In camp we never know what is happening in the outside world, as there is no wireless and only an occasional paper. We came to Saugor last Friday and since then we have had a comparative rest and it has done us all good. Here the mess is in a bungalow and about 20 of us live here too. The rest of the officers sleep in another bungalow just across the road. The men are in a hutted camp about ¼ hr ride away on a cycle. You will no doubt have had my airgraph saying a little about the flood. Well since then we have a new camp site in the jungle and it is much more pleasant. Nice and dry and well away from the river and danger. That night, Sunday 26th July, is one I shall never forget. On the Saturday afternoon we lost our C.S.M in what was on an ordinary day is a mere stream, but which on that day was a raging torrent, the current being so strong that it simply swept you off your feet. We had a big thick rope right across the river so we could hold on to it and thus save ourselves from being carried away. Unfortunately the C.S.M’s feet did go from under him and he was unable to hold on long enough to the rope, for us to get to him. The current then took him away at such a speed that we couldn’t find him as the water rushed away. We found his body 3 days later after the flood had subsided. That same evening after we had had our supper two of us, another officer and I, found we had to swim about 170 yds back to our platoon area where the tents were. We plunged into the water and got over all right. We now had the main river on one side of us which was a raging river about 300 yds across and this quite still water between the rest of the company and our area, on the other side. All night the water rose and about 3.30am we had to leave our tents and go to some higher ground very near us. By 5.30 it was light and two of us, a sergeant & myself, went off to find a way, if possible, back to the company. There was only one way there was any chance and by a miracle we found that there was still a part that was not covered by water and thus that we were not quite on an island. We got the rest of the men away safely, and weren’t we glad to be away. We discovered after the water had gone down that it had been right up over our tents and unfortunately all the small things which had been lying loosely about in my tent were washed away. Luckily my tin trunk & valise were still there, but everything was soaked with dirty muddy water and a few clothes are completely ruined. But still I was lucky because the other officer lost all his kit & he had only just arrived from England. I have managed to buy myself another pen today from our canteen. I was very sorry to loose my other one, as I was very attached to it. Do you remember the day we went out and found it nearly in the water when we were down at Bigbury? Let’s hope it won’t be too long until we can have another lovely holiday together. I expect you will be back from Edinburgh again now. You will have loved seeing Auntie Mary and the rest of them I know, and I am sure the little change did you good. How did the interview go? I wonder if you saw Mary at all. I don’t suppose you did because it is quite a distance between Edinburgh and Glasgow. I was surprised to hear that Joy and Mary sometimes write to each other. I wonder what she has said in her letters to make you think she is fond of me?!! Thank you very much for forwarding the two church membership cards. Please thank Mr Gibson and tell him I hope he and his family are all well. I wonder how many people you get at church these days, but we do occasionally get a “wandering padre” to visit us, and when this happens a lot of us go along. Our food is decidedly plain these days. The days of Secunderabad are over. We get plenty of good plain food, quite well cooked by the army cooks over little open fires. We get exactly the same kind of food as at home. We were all rather surprised we didn’t get Indian food when we got here first, but now we all say “ No thanks”!! I am in the mess writing this, it is nearly 10pm and it is just about time for bed. There are several of us here, writing, reading and listening to the wireless. Very pleasant. Never before have we realised how little things count. A wireless, electric light, comfy chair, nice white table cloth, they all are wonderful things when you can’t get them. Shall finish this tomorrow now as am very sleepy, do for tonight, “ God bless” and sleep well. I forgot to mention earlier on that we no longer have our topees but look like real Bushmen these days in hats exactly like the Australians. We look a tough lot of I don’t quite know whats!! They are very comfy and much more suitable than the topee. I hope we still have them when we return home. Out here we get no long evenings neither any very short ones. These days it is dark by about 7.30 pm and in the winter, Jan & Feb, about 6.30 pm. We get very, very dark here, much blacker than at home. So far I haven’t come into contact with any Penarth fellows. There must be quite a number here now. Wouldn’t it be funny if some day I bumped into John. Do let me have his address sometime as I would love to get in touch with him. Has he come out here with his battalion or was he with a draft? You will be at Porthcawl I expect by now: How does little Sam enjoy it? He will love all the new smells I know. Well for now I don’t think there is any more I can say, except I am very well and remarkably fit. I rather fancy I have grown a bit too, but am not sure. I do hope you all are very well and that you are getting a really nice summer. The seasons out here are all a bit strange, the nicest time being the winter between December and the end of February. So for the time being cheerio and all the best. With tons & tons & tons & tons of love from Graham. Pictured right is a photo of Wingate and his then Brigade Major 'George' Bromhead. They are talking over tactics in the map room at the Imphal Golf Club, Graham Hosegood became Wingate's Brigade Intelligence officer for operation Longcloth and would undoubtedly have spent many hours in this room. (Picture taken from 'Wingate's Raiders', by Charles Rolo). Here are two more pages, one a post card, the other an Airgraph, explaining his close involvement with the Brigadier. I have had a lovely lot of letters this week from you including Dads & the other birthday letters, also a delightful little snap of Mum & Sam. Thank you so much. I have written a letter in reply to them. Yesterday I had another letter from Joy and an airgraph from Mum. So glad that a letter got home in 6 weeks. How long do these P.C’s take? We are still in the jungle but it is a very different place now that there is no rain. It is thoroughly enjoyable and our food is excellent. I only wish you could be having bacon & egg each morning, butter cream, marmalade. So you see we do all right and there is nothing to worry about. I am now up at Brigade HQ doing Bde Intelligence officer. The other fellow has a new job. I am enjoying my work immensely and at long last can use some of my Matlock experience. I have been here just a week and have settled in nicely now. There’s a lot to do but it makes the time go very quickly and I’m perfectly happy. It’s like old days when I was at Bde at Colchester. The weather is heavenly now; just like an English summer only fine every day. It’s cooler by a long way than it was 10 days ago. We don’t get the long evenings though as its dark at 7pm and not light till 7am. Do hope you all are very well. I am fine. My love to all the neighbours & when you see David next congratulate him for me. There’s a chance of a few days leave this month but nothing definite yet. Tons & tons of love from Gra. I haven’t been able to get a line off to you for a fortnight as things once more have been very busy. I have been away with the Brigadier and seen a lot of interesting places. We left Jhansi on New Years Eve and went first of all to Delhi where we spent 24 hrs. We stayed at a first class hotel called Maidens Hotel which is in Old Delhi but did our work out at New Delhi, which is about 5 miles away. Then, don’t get alarmed; I had my first trip in an aeroplane when we flew from Delhi to Calcutta. I thoroughly enjoyed it and feel quite an old hand in the air already. That trip took us about 8 hrs and it was wonderful to see the Ganges from the air. We spent one night in Calcutta and them flew up to Assam the next day. We spent 5 days there at places I can’t mention, and then went back to Calcutta last Sunday where we stayed until this morning. We had a lot of work to do there but it was lovely to be in a nice big city again and see all the people. I saw three films there and the food was excellent. We went back to Calcutta by train and at one spot we had to cross the Bamaputra River by a ferry. The boat was just like the old stem wheelers you see on the films going up and down the Mississippi. Today we flew back Assam where I am at present. Hope you got my cable that I sent off yesterday. Am very well do hope you all are. P.S Shall be writing a letter in next few days. Once again we are camping with just the sky for a roof. The weather is just nice and we don’t think we are likely to get drenched especially now that the dry weather period is here until May. Letters for a bit are going to be a bit short as there is going to be no time for writing, but you will be getting a card or airgraph once a month from someone who will be writing for me. I am very well and all of us are in great spirits. Do hope you are all very well. Spring will be just about with you again when you get this. Hope I shall be home for next spring. Very many happy returns for you birthday Dad, So for now, tons & tons of love from Graham. Very fit and well. Will write wherever possible much love Hosegood. Outlined below is a blank version of the monthly postcard, that was sent out to all the families of Longcloth personnel during the operation. These were standardized correspondence and were sent out to the next of kin, regardless of the status of their loved one. 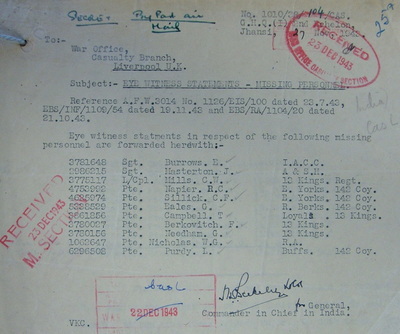 Only after the majority of the men had returned to India (roughly by early July) were families informed that their man had been killed or was missing in action. 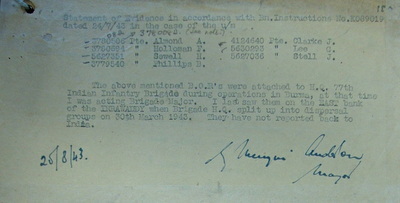 Taken from Wingate’s Report on Operations of the 77th Indian Infantry Brigade 1943. Headquarters, 77 Ind. Inf. Bde. No…………….. Rk……………… Name …………………………………………………………………. is taking part, it is regretted that he is unable to communicate with you himself. It is desired, however, to notify you that he is fit and well and will write to you as soon as circumstances permit. You are requested to continue to correspond with him and to ask his relatives and friends to write to him as usual. Arrangements exist whereby all such letters will be delivered to him. The change of address as above, should be noted. Until such times as he can communicate again with you himself, a notification similar to this will be sent to you once a month. Staff Captain 77 Indian Infantry Brigade. The next set of letters are from men who served with Graham on operation Longcloth, or came to know him in Rangoon Jail. The jail (pictured left in April 1945 and courtesy of the N.A.R.A) was to be home for the Chindit POW's for about two years. 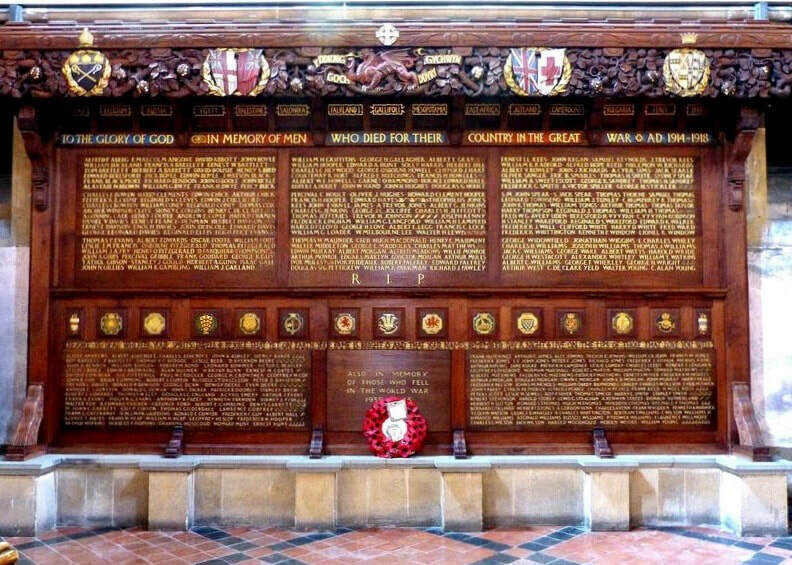 May I take this opportunity in expressing to you both my deepest sympathy at the death of your son Captain Graham Cowell Hosegood who died in Rangoon prison on the 9-4-45 of this year. 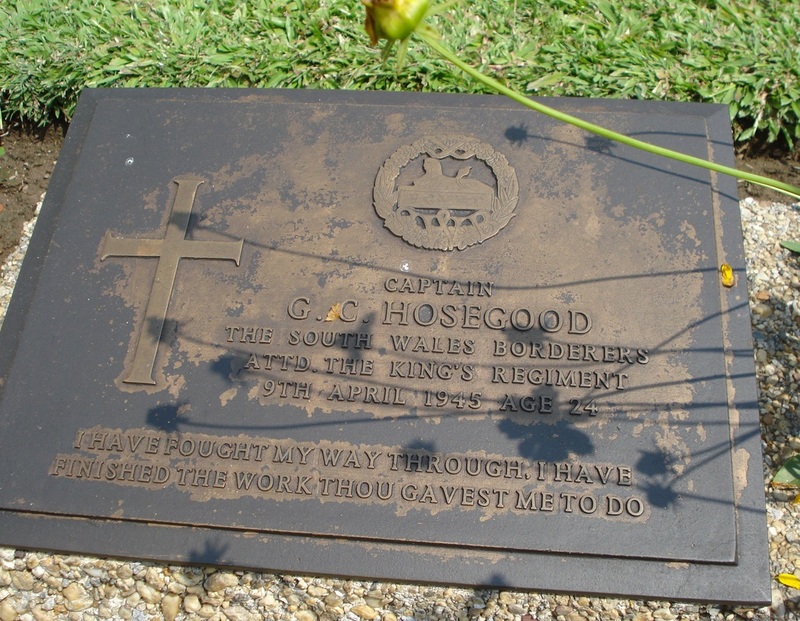 I knew Cap Hosegood from Gordon Hill days, when the 13th Bn. the Kings Reg was first formed. He was then of course first Lieut. on gas, he had an outstanding personality and was loved by all who came under him. I had the pleasure of serving him at various times throughout the Burma Campaign with Wingate who I know thought much of him. Being a prisoner myself in Rangoon I had the privilege of being some help to him when ill with jungle sores early in 1944. Naturally a firm friendship sprung up between us, and it was a great blow to me when he died. I sat with him for some time, he did not ask me to write, although I asked him if there was anything I could do, I would gladly do it, But he only smiled and shuck his head. I feel however, he would not be all together displeased with me if I wrote to his family of whom he loved dearly, explaining the circumstances of his passing. Six weeks before Xmas, your son complained of shortness of breath, but he was not alarmed. He was of course sent to hospital where once more I was of some help to him. Just before Xmas he received from the Red Cross the first batch of mail from home, some 33 postcard in all. He was over joyed with them, he showed me the photo of his Mother Sister and Dad and of course the dog. Some of the postcards were from his girl friend from Glasgow who he intended to marry. He was overjoyed with the photo, and it wasn’t long before I knew how much his family meant to him, his plans of the future after the war. His health seemed to improve and he looked forward to being sent to his own compound again fit and very happy that he had news from home and his girl friend. Then on the 6th April 45, he went down with fever he was given quinine which unfortunately weakened his heart. Although Dr Ramsey did everything in his power, and everything that could possible be done by his friends and orderlies, he passed away as I say on the 9th April 45. He was given a decent burial in Rangoon Civil Cemetery. In conclusion, I do hope that I have not added to your deep distress. Once more I convey my deepest sympathy at your great lose. He was a fine fellow, and it is so dreadful to think that he was so near to being saved. P.S I have been ill, and only now able to write. It is with very mixed feelings that I am writing this letter, as I do not know if I am wise to open up a subject, which must have such sad memories for you and your daughter. It concerns your son Graham with whom I was a prisoner of War in Burma and with whom I became very friendly. It is news which you will not have heard from the Authorities but which should make you proud and I hope, happier than perhaps you have felt up to the present. I had been a Prisoner of War for sometime (having been shot down in flames by ach ach fire on 26th Feb 1942) when a new party of Prisoners arrived at Rangoon jail where we were kept in captivity. This new party were members of Wingate’s Brigade of which you son was Intelligence Officer. That was my first meeting with Graham but our real friendship did not really develop for sometime, until he was transferred to the compound in which I was kept. From that time onwards we were very great friends and spent most of our spare moments together. A number of Grahams fellow officers were prisoners in the same camp and I personally never heard a word said against him - in fact, I heard of nothing but good both from the officers and men. As it was before being captured, so it was afterwards. He was generally liked and even during those times when things were pretty grim, he was one of those who made you feel proud to be British. Graham and I naturally talked a lot of ‘home’ and our ‘folks’ until we almost felt that we really knew each other’s families. One thing worried us in fact, it was a worry of the whole camp - and that was whether we had been posted as Prisoners of War or not. No Red Cross System was in operation and it was not until, I believe January 1945 that we received some letters from England. Many of us were terribly depressed by having no post from home and in my own case it was not altogether surprising as I had never been reported as being a Prisoner and had been given up for lost a long time previously. However, Graham received quite a number of letters and Post Cards and was a fine friend to me in letting me share most of your news. That is the news which I hope will make you feel happier because believe me, he was delighted and particularly so with a photograph of you which was enclosed in one of the letters. From that day onwards, Graham was one of the happiest men in the P.O.W Camp and he never gave up or lost hope until he died. It was a sad day for many of us when Graham passed away but a day of which you should be proud now that the shock of the news has worn away. He died a true Britisher and Soldier, unafraid of the future, liked by all and above all, having done his duty nobly. Perhaps you may think I am being too sentimental in which case you must forgive me - But I was his friend. I was unable to attend the funeral but I understand that he was buried in the same portion of an English Cemetery in Rangoon where other members of our camp were buried. I have been there and it looks like a piece of England - quiet, peaceful and untouched by Japanese hands. One more point I must tell you before I close. Graham spoke to me many times of someone called ‘Mary’ of whom he was very fond and from whom he received some mail at the same time as receiving yours. It may please her to hear of this although I of course, leave it entirely to you as to whether it might cause unnecessary unhappiness by so doing. Well that just about completes my story and so I must close. I do hope that this letter might bring you a little happiness and possibly give you a little inside - entirely unofficial - news from one who is proud to think that he was a friend of your son. Guy W. Underwood. (Ex Ser/Lieut RAF). The next letter is a thorough account of Graham Hosegood's final days of freedom before becoming a prisoner of war and the details of his death and subsequent burial. It was sent to the Hosegood family in July 1947, by Lieutenant 'Willie' Wilding, who had been with Graham in HQ Brigade and on dispersal. 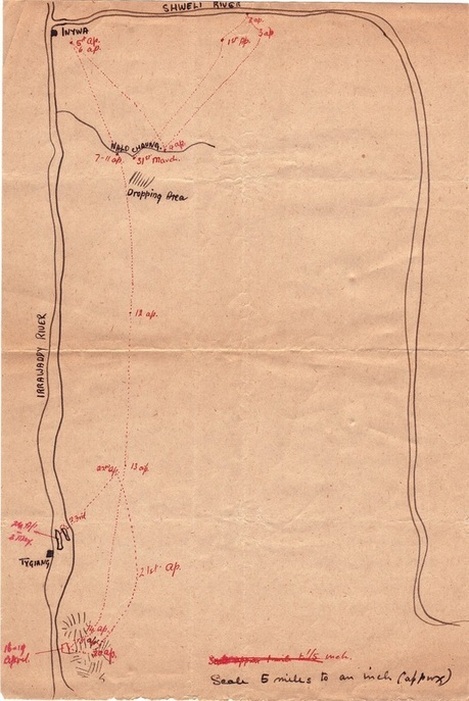 Pictured left is a roughly drawn map, with which Wilding shows the dispersal groups final movements close to the banks of the Irrawaddy and Shweli Rivers, back in April 1943. You will clearly appreciate what an important letter this must have been for the family and their understanding of what had happened to their son and brother. Thank you for your letter and good wishes. I only wish I could have done more for Graham. In the following story I want you to believe that I am sticking to the whole truth. I am not trying to increase your pride in Graham in order to relieve your sorrow. He did his duty and more than his duty. Our adventures while the Brigade was still a fighting force have been described by many - sometimes distorted and exaggerated, but they are public property and you must know them well. Our private adventure started on 31st March 1943 when Brigade H.Q. Split up and Graham led his small command away to try and escape back to India. The party consisted of Graham (I/C), myself, Pat Gordan (The Bde H.Q. Animal Tpt Officer), Jimedar Moudie, Rifleman Orlando & Tunnion (all three Burma Rifles) and twenty two British other Ranks. Remember we were all desperately tired and rather hungry, but we had just received a supply drop and had 5 days rations each. We all had rifles except Graham and I who had revolvers, and we had fifty rounds per rifle. We were 200 miles behind the enemy lines and had no prospect of help from anyone; moreover we had been stirring the Japs up for some six weeks. The men were all specialists. That was the debit side. In our favour we had in Graham a leader in whom we all reposed the greatest confidence - he had shown himself brave and cool in action, and uncannily efficient at map reading and compass marching. Two accomplishments worth rubies in the jungle. So Graham set out at the head of his little party with high hopes and Thank Heavens full packs. That night we marched to and bivouacked at the Nalo Chaung. This was a most friendly watercourse - wherever you dig you would find water. There Graham and I shared a tin of beans and one of bully. This was a great extravagance but as we had marched fifty miles in the last 48 hours on a packet of biscuits between us we felt we deserved it. Next day we started - North to the Shweli - we did not like it - water was scarce on both sides and we had to have water. But the Brigadier had given his orders and he was obeyed. So we marched north from dawn to about 3pm. It was very dull - the only remarkable thing was that we (or rather Graham) made a perfect ‘landfall’ (You must understand that the jungle is as featureless as the sea) and we halted at the stagnant pool which we had aimed at, after a ten mile march, a piece of navigation which spoke well for our chances. We spent the night there, and were distorted by mosquitoes. That was April 1st. The morning of the second ushered in a much more exciting day - we moved up to the river - sent Moudie out to look-see, but he found no boats - we made a bamboo raft and launched it at about 11pm. After a most hectic day. But bamboo is treacherous stuff and very noisy - no sooner had we got it into the river than the Japs opened up from the other bank with everything they had. Our rifles made a poor reply- however we fired a few rounds - probably uselessly - and withdrew without loss into the jungle - and slept solidly until mid-day. The jungle was terribly thick here and an Army Corps would have lain hid easily so we were safe as in church. Graham woke at mid-day and got us going at once, he knew morale had slumped and we must not be allowed time to think. At this time the whole weight of responsibility was on Graham’s shoulders. Pat was a most gallant fellow - brave to a fault but plans were not his forte - I had been overworked as Brigade Cipher Officer and could scarcely keep going for the first week or so, poor Graham knew ‘The loneliness of high Command’ as keenly as any Admiral or General. Well, we marched until dusk - cutting our way, as we dare not use tracks, through creepers three inches thick until we could go no further and we ate sparingly - and slept exhausted. That was the third of April. Next morning we were off again - we had to find water so we shaped our course for the Nalo Chaung. We arrived there quite done up by 4pm. Then we found water - the first since the Shweli. We drank pints made tea and felt much better. Graham announced that next day, the fifth of April, we would march to Inywa - at the confluence of the Shweli and Irrawaddy where we had tried to cross, as a brigade, on 30th March. The Japs would never suspect a second attempt there so soon and we knew that there were boats. So off we set again, spirits high and halted about two miles from the river. Moudie and his men went forward to scout while we impounded the water bottles and issued sparing rations of water. Dusk fell but Moudie had not returned. Next morning patrols went out but we had no luck, we must wait until next morning. Graham and I spent some time cutting each others hair and trimming our beards. Graham had a beauty - red and curly - mine was no good. At dusk Orlando and Tunnion arrived - Moudie had been fired on and killed they had returned as soon as they could - Inywa was full of Japs. Poor Moudie - we had lost a friend and faithful ally. (I should say now that in fact Moudie was not killed. We met him again at Maymyo - and I believe that he gave the information of our capture to the authorities when he made his escape later.) We were in trouble again; two days in a very hot jungle with one water bottle per man is unpleasant. We must have water so on the seventh of April we returned once more to our haven at Nalo Chaung. Of course we went to a different point each time but we had to have water - our rations were concentrated and sustained without filling - also tea was our stand by and in adversity we just had to have tea. By now rations were getting short and Graham had a brain wave. He sent a party under Pat to the dropping area to get any rations they could find that Brigade had left. They brought back six days worth per man - all we could carry! It looked as if Heaven was on our side. Graham made yet another plan - one which I still think was the best possible for us. We were to march due south for about 30 miles to where the hills rose out of the jungle near the river. There each man was to make a small bamboo raft - to carry boots and rifle and pack. Then with this as a life belt we were each - in our own time to swim the ¾ mile wide Irrawaddy. Graham called the men and told them the plan. Spirits soared again - we were to start next day the eigth April. Then our troubles began - a man failed to return from the water party sent to fill bottles. He was a difficult man and probably light headed with fear - anyway he would probably blunder into a village - and be captured - under pressure he would give away our plan (and I for one would not blame him). There was nothing for it but to wait for a few days to see what would happen, perhaps he would return - and if the worst should happen - the Japs would be out in there time table and we could get through. In any event a rest would do us all good. So off I went to the dropping area taking an unarmed section so we could carry more, found another six days per man and returned in triumph only to get a wigging from Graham for risking it. He was quite right of course it was an unjustifiable risk but one which, in the same circumstances I should take again. On the ninth, tenth and eleventh of April we rested and stuffed two days rations each. Don’t blame us, we could carry no more than six days and this we had safely in our packs - we were awfully hungry and anyway the rations weren't much. Those were good days. We could not wash - water was too scarce but an early monsoon shower blew up and we all danced naked in the rain. Then we realised for the first time how terribly thin we all were. Most of the time we lay on our backs and yarned away. Graham told me about you all - of the lights of the ships in the channel - of the wash basin you had fitted in his room, of his hopes and ambitions for his career in the shipping trade. It was then that I learnt how devoted he was to you all. On the twelfth we set out again - south. Ten miles a day was our limit them we should need a couple of days to get across the river and we should still have a days ration in hand to carry us a safe distance from the river. We marched for three plodding dull dusty days - then we were in the hills. The only excitement being on our second day we found a running stream - our first since the Shweli. We were loath to leave it. So we reached the Hills by the evening of the fourteenth. On the 15th I took a patrol to the river, but the jungle was too thick and I had to return. Graham sent a sergeant to try further south - he returned reporting success. So on the night of the fifthteenth we were to start. A re-entrant easily visible was fixed as a rendezvous and all should have been well - Graham and I went forward and Pat was to join us at dusk. Then came another set back - the rafts were too big and could not possibly be carried through the jungle. So we had to wait a day while the men remade them. I was furious but Graham - as calm as ever just switched his plan to a day later. On the sixteenth then we did set out going carefully down the almost sheer west flank of the hills and reached the jungle just as it was dark. The going was frightful. We cut our way and made a few hundred yards by midnight then the moon sank and Graham gave the order to bivouac. I am afraid that the Sjt’s patrol was not truthful. For two days we fought and struggled through the jungle - one man went mad but recovered later - the Jungle got even thicker - rations had run out and our reserves of strength had been used up by this hectic cutting. Graham had the high courage to face the fact that even if the river was at our feet we could none of us have swam it. Then we found a track running East and North - we halted about 100 yds away from it and Pat went off with a section to find a village and bring back food by force if necessary. In a couple of hours he was back with dried fish, salt, rice, tomatoes and jaggery (a sort of crude fudge) and, more welcome than any, a promise of a boat. So on the night of the eighteenth we slept with a full stomach and light hearts once more. On the nineteenth and twentieth we moved round in the jungle as a precaution against treachery and kept in touch with the village. I think they were honest enough but they could not keep their word. The Japs pinched their boats. So on the evening of the twentieth I took a section to forage - our friendly village was by now full of Japs so we had to find another. We met a hostile reception but we showed fight and got away with some rice and fish, rejoining Graham in the hills. This was on the twenty-first in the morning. Graham had to make another decision - this time we would swing east - cross the Shweli where it was not so formidable - then north into the Kachin Hills there we would be sure of a welcome. We would spread out our force and live in villages until an opportunity presented itself for a return home to India. So on the morning of the twenty-first after a short rest we set out, left the friendly hills, and went east by north. By midday on 23rd we were back at our old bivouac by the running stream. This time we could not tear ourselves away so we all bathed and slept there. Another foraging raid was essential as we had a couple of days march before we reached the Shweli and we dare not be seen marching east. It was Pat’s turn - Graham wanted to go but he was too valuable to risk - so we would not let him - and as usual Pat came back with food and the offer of a boat. This time he kidnapped the headman as a guide and a hostage. That night we were guided down to the river. We did not like it a bit, but it was clearly our duty to take every chance to get home - so we felt we must risk it. Graham’s chief worry was that he could not tell from what point we should cross - there was an island - just after the moon rose we set sail - round an island and then ashore we marched west - found our way barred by an arm of water - we made north and passed the barrier - we came to another and found a way round - then we found a stretch of water which we could find no way round. It was peaceful looking under the moon so I as the shortest started to wade it. Soon it was up to my neck and then I was swept away. I am a strong swimmer but had my work cut out to make the shore. Clearly we had been sold to the Japs. We were on a second island not marked on the map. We sadly retraced our steps - got into the cover of some elephant grass and prepared to fight it out. This was the twenty-third of April and for seven days we lived on that island - 1 mile by ½ mile - straining every nerve and planning how to get off. Our food ran out but there was all too much water so we could live. On the seventh day Graham came back from a dangerous early morning swim with news of a boat - a wreak - but - perhaps! We worked all day on it with our Kukris and made it seaworthy. It would carry five so Graham ordered that Pat should go across first - he felt that Pat, whose parents had lost their other son already in the war, must have the best chance. This was very typical of Graham’s thoughtfulness. Alas! Before they could land the Japs opened fire. Poor Pat never had a chance - but he got his two B.O.R’s and his two boatmen (Orlando and Tunnion) ashore and after a short fight there was silence. We never saw Pat again nor either of the British Soldiers. Orlando and Tunnion were captured. Of course all this took place at night and it its difficult to say what really happened. On Graham’s orders - we were to split up in two’s and threes and spread ourselves all over the island to make it more difficult for the Japs to find us. I found myself alone looking west across the river to Tiyang from whence we expected the Japs - And they came. I need not stress the loneliness of those three days. On the third day - one hour after darkness fell we went to rendezvous at a given spot. We all met but not Graham - he and two men had been hunted and could not get to the place appointed. I had to make the decision. We must fight - but we had no bayonets and our rifles had seized up having got wet and as we had no oil. We could not put up any sort of show against some two hundred Japs and Burmese - fighting was useless- we must surrender - it was a bitter pill, we thought perhaps that the Japs would be content with us and forget about Graham and his men, but their intelligence service was too good and they collected him next day. That was the end of our freedom. I should like to add one thing - please put away from your thoughts the question of torture during interrogation. Graham and I were able to co-ordinate a story which the Japs did not shake. I need not say that it was not the truth. Graham was true to his duty and gave nothing away but he did not suffer torture please believe that. It is absolutely true. Other people will have written to tell you of Graham’s great patience and courage in Rangoon, he never complained or groused he was always cheerful and he was kind to everyone - you may be very proud of him. He was buried on the 9th April in the Rangoon Cemetery. The funeral party consisted of Flt. Lt. Edmonds, Lieuts Horton, Gudgeon, Gibson, Quale and myself. We were as well turned out as borrowing could make us. His coffin was carried out on our shoulders through two ranks of his comrades to the salute. Then through the guardroom with the Jap Guard at the present. Then - forgive us we could carry him no further and had to use a hand cart through Rangoon to the cemetery - a grave was dug - we said what prayers we could - saluted - took the union Jack we had used for nearly three hundred friends - returned sadly. I had lost a great friend. This is a long story - it is quite true, you will be proud of Graham he never forgot any of you and he never forgot his religion. Please let me know if there are any further questions you would like me to answer. By now you will have been told that you son must be considered missing and I should like to say on behalf of myself and his many friends in the Brigade how much we sympathise with you in your anxiety. There is I’m afraid very little that I can add to the official notification. He was last seen fit and well at the end of March when he was starting off with a party of troops to make his way back to India, since when neither he nor any of his party has been seen. He was on my H.Q. and his amazing energy and unfailing cheerfulness on all occasions endeared him to all, and make him also a great example to all, and we all feel that we have lost, temporarily we hope, only, a great friend whose unfailing good humour was a stand by. Should any more news become available you will of course be notified officially and I will do my best to keep you informed unofficially. I am thankful to be able to tell you that there is definite news that your son is a prisoner in the hands of the Japanese in Burma. One cannot be 100% certain since it depends upon the evidence of escaped P.O.W of my force who - being Sushimo - are not absolutely reliable in the matter of English names - but it seems reasonably certain that Graham is alive and well. I shall continue to follow the matter up. It gives me great pleasure to be able to tell you this! At the same time I would like to congratulate you on a very good loyal intelligent and devoted son. He was my Int. Officer and never did I.O have a more exacting job. He did it excellently well & his unfailing cheerfulness & courage were an example to all of us. My kind regards to you & to his mother. The enclosed photographs of the grave of your son have just been received. They are, however, by no means up to our usual standard, either as regards the prints, or as to the conditions of the graves as seen in the photographs, and we were in some doubt as to whether to send them to you. I feel I should like to explain the reason why the photographs are not up to our usual standard is that the work of photographing the graves has been severely handicapped, not only by the shortage of experienced photographers and the scarcity and poor quality of the material available, but also owing to the extreme climatic conditions in the East. The question of obtaining better photographs had been taken up with the Graves Services Units, but for the reasons stated above, it is unlikely that any further prints will be obtained. We feel, however, that in spite of the poor quality of the prints it would be your wish to have them. The inscription on the cross may not agree in every respect with the correct particulars of the deceased at the time of his death, but under present conditions, owing to the shortage of personnel, I regret it is not possible to have the inscription on temporary crosses altered. In every instance where this occurs, arrangements have been made for the correct particulars to be inscribed on the permanent headstone when it is erected by the Imperial War Graves Commission. Director, Graves Registration and Enquiries. 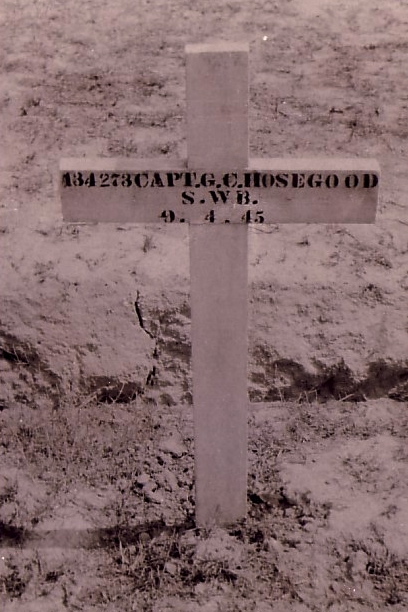 Pictured below is a photograph of the original memorial cross marking Graham's place in the newly constructed Rangoon War Cemetery; next to it is the memorial plaque that sits in the same spot today. Added on 20/09/2013, another photo of the permanent memorial plaque at Rangoon War Cemetery and a photograph of the War Memorial at The Leys School in Cambridgeshire. Graham is remembered on the panel seen to the far left as we look, sadly weather erosion seems to have taken its toll on the inscription stone. 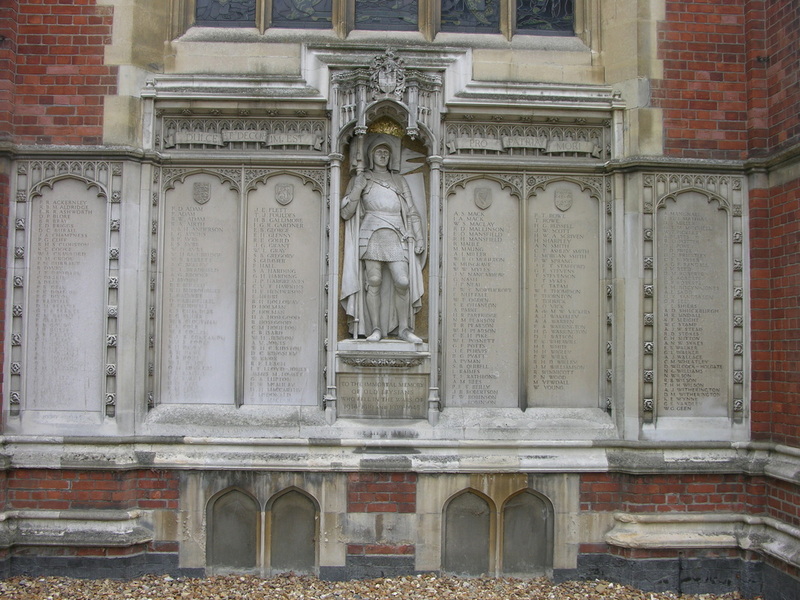 My thanks go to John Harding from The Leys School for providing me with and allowing me to use the photograph of the school War Memorial. Updated on 30/10/2018. 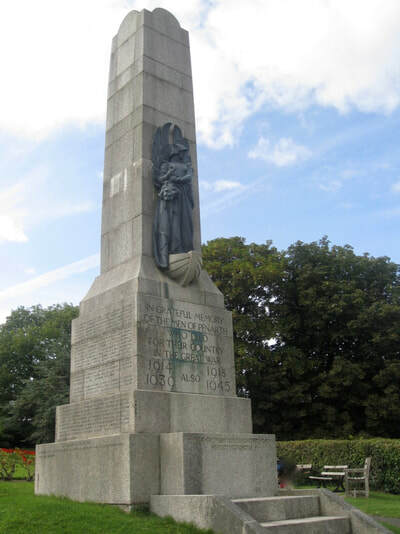 Graham is also remembered upon the Penarth War Memorial, located within Alexandra Park in Beach Road. 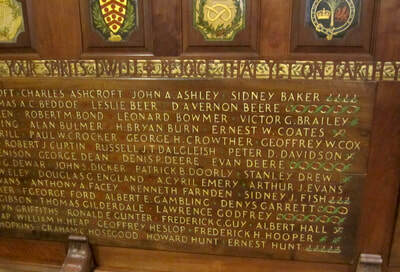 His name is also inscribed upon the WW2 Roll of Honour in St. Augustine's Church, Penarth. To finish this story, here are the views of three other men who knew Graham Hosegood. Pictured left is a page from the diary of Henry Ross Power, an officer from the Dogra Regiment who had been held in Rangoon since the retreat in 1942. He had been very senior in Rangoon Jail and had kept secret records of the POW's details, especially in respect to their deaths and burials. 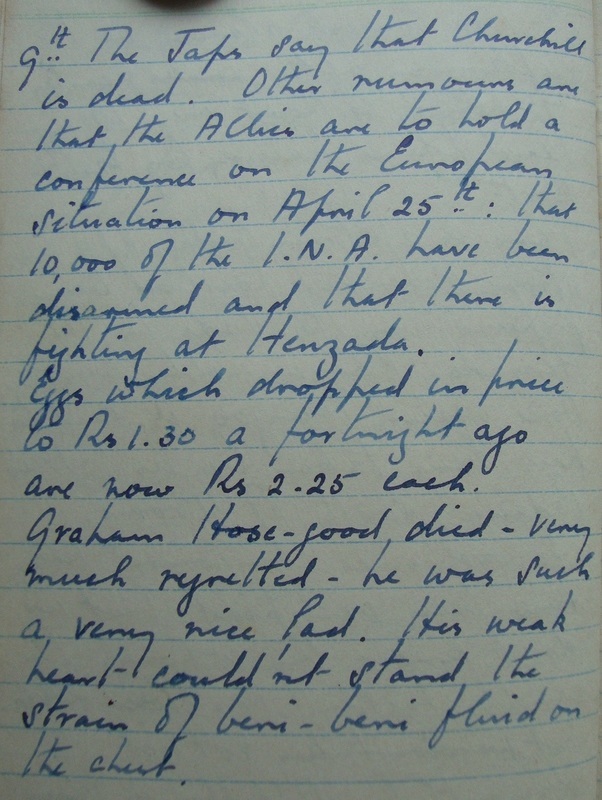 Here on the 9th April he notes several incidents of the day including the death of Graham. "Graham Hosegood was a very good friend of mine in Rangoon, and a very good officer. It was a crushing blow to us all in Block 3 when he died, and so close to our liberation too." Finally, the views of Denis Gudgeon, who also shared the cell room with Graham, in fact Denis told me that in his cell room in Block 3 he had Graham Hosegood sleeping to his right, with Alec Gibson to his left. In this cell there were no real beds and the 30 or so men just camped down the best they could on the floor. Denis, unsurprisingly, became very emotional when we visited Rangoon War Cemetery on the British Legion pilgrimage in March 2008 and it was standing over Graham Hosegood's memorial plaque that sparked this reaction off. Update 10/01/2013. I am now able to add an audio segment from recordings my brother and I made when interviewing Denis in Burma during our trip there in 2008. Here is how he remembered Graham, reiterating the sentiments written above. 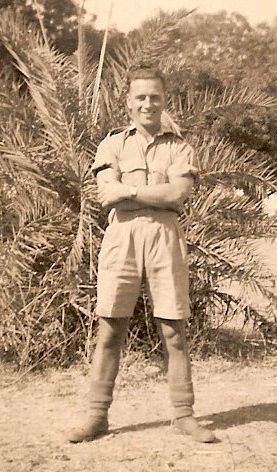 Graham Hosegood in India, 1942. Over the last few years, as information and new stories have been sent to me, patterns and themes emerge and slowly but surely groups of men are pieced together, sometimes by good fortune, but often after painstaking cross-referencing and double-checking. Recently, I have been looking through my notes on Pte. 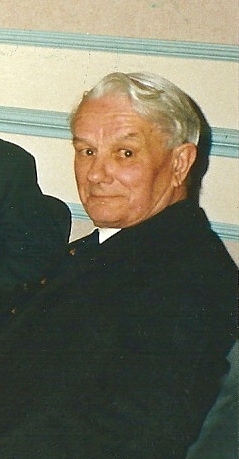 Fred Holloman who was a member of Graham Hosegood's dispersal party in 1943, after both men had served with Brigadier Wingate's Brigade HQ during Operation Longcloth. Holloman mentions that the number in his dispersal party was roughly twenty-five men. 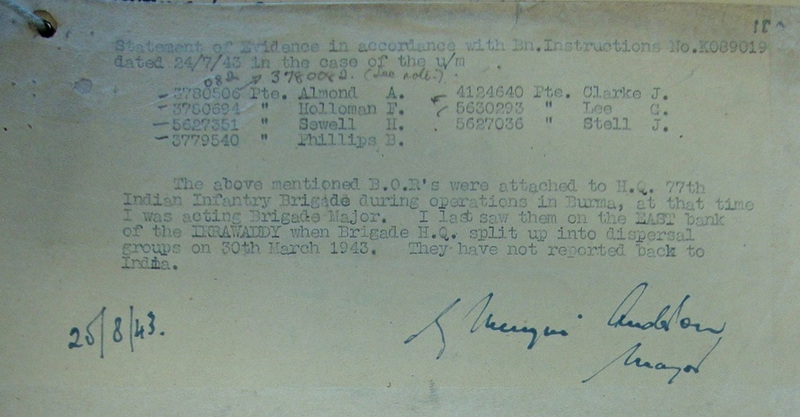 This information made me go back and cross-reference the missing in action listings for 77th Brigade and immediately pieces of the jig-saw began to fall into place. I have been extremely fortunate over recent months to have drawn up three stories about men who were also part of Hosegood's group and another who may well have been. As mentioned, much of the information confirming membership of this dispersal party already exists on these website pages. In order not to regurgitate all of this again here, I am simply going to list the men with a short explanation of the evidence pointing to their belonging and any brief information about what happened to them in 1943. 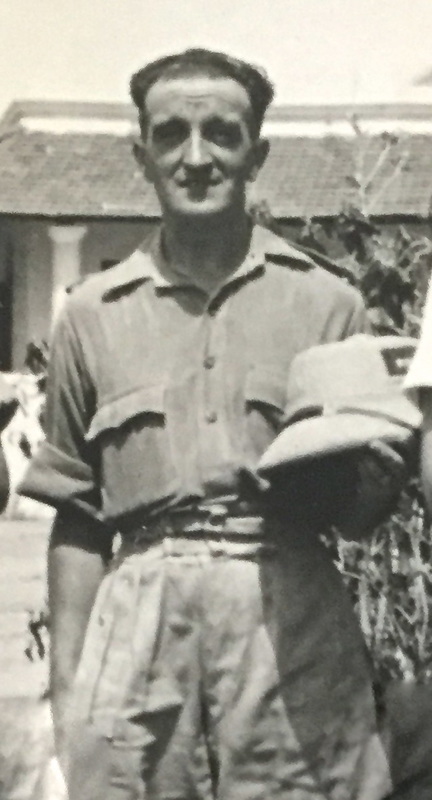 Lieutenant Richard Allen Wilding was Wingate's Cipher Officer during Operation Longcloth and had been sent to join the first Chindit Operation from his original unit, the 3rd Queen Alexandra's Own Gurkha Rifles in late 1942. 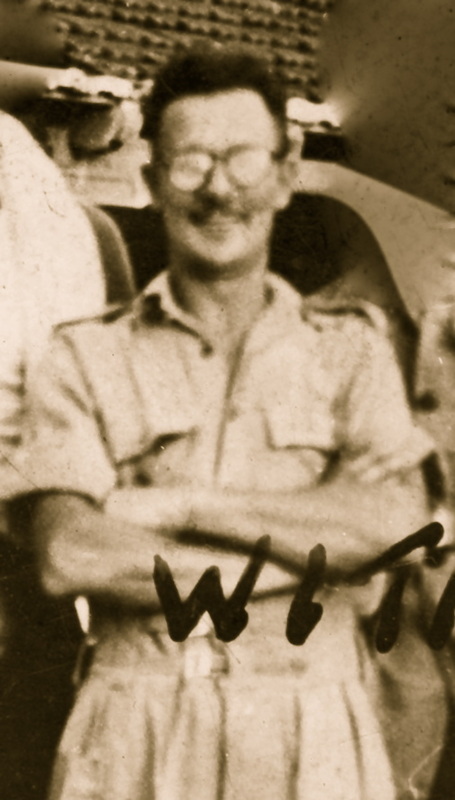 Known to all as 'Willie', Lieutenant Wilding was chosen as the second officer in Hosegood's group and the two men were to share many a long hour together from that moment on, right up until Graham's untimely death in Rangoon Jail in April 1945. 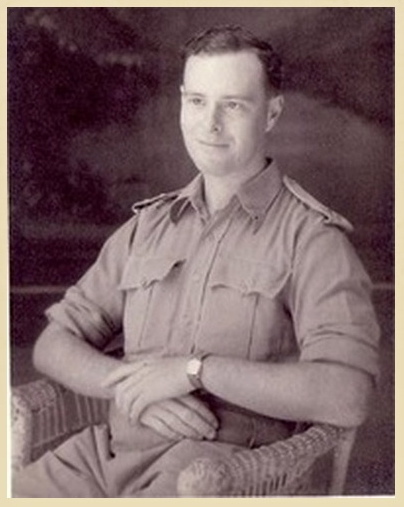 Lieutenant Robin Patrick Gordon was originally an officer with the 8th Punjab Regiment, before joining Chindit training almost at the last minute in January 1943. Lieutenant Gordon was posted to Brigadier Wingate's own Brigade Head Quarters and acted as Animal Transport Officer for the unit in Burma. Gordon is the man mentioned in Wilding's letter to Graham's parents (seen above) as being in the lead boat which attempted to force a crossing of the Irrawaddy River on the 29th April. Sadly Lieutenant Gordon was killed during this action. ​Lance Corporal 6296508 Leslie Albert Purdy who was the son of Violet May Purdy from Walthamstow in Essex. Leslie, originally a soldier in the Buffs (East Kent Regiment) had joined 142 Commando on the 30th September 1942 at the Chindit training camp in Saugor. He was posted to Wingate's Head Quarters later that year. The CWGC have Leslie's date of death recorded as the 14th April 1943, however, all documents in relation to his disappearance on Operation Longcloth show his missing in action date as the 30th April. Fellow Commando, Pte. James Dixon gave a witness statement after his liberation from Rangoon Jail, stating that he last saw Lance Corporal Purdy on the 30th April attempting to cross the Irrawaddy, this backs up the information contained in Lieutenant Wilding's letter and almost certainly places James Dixon with Captain Hosegood's dispersal party. Sir, a Purdy was attached to my party of 26 when Brigadier Wingate split us up into small party's, but I do not know if it is the same one you mention. This man was in the 142 Commandos and was in Brigade Head Quarters. He was killed whilst trying to re-cross the Irrawaddy River with me. 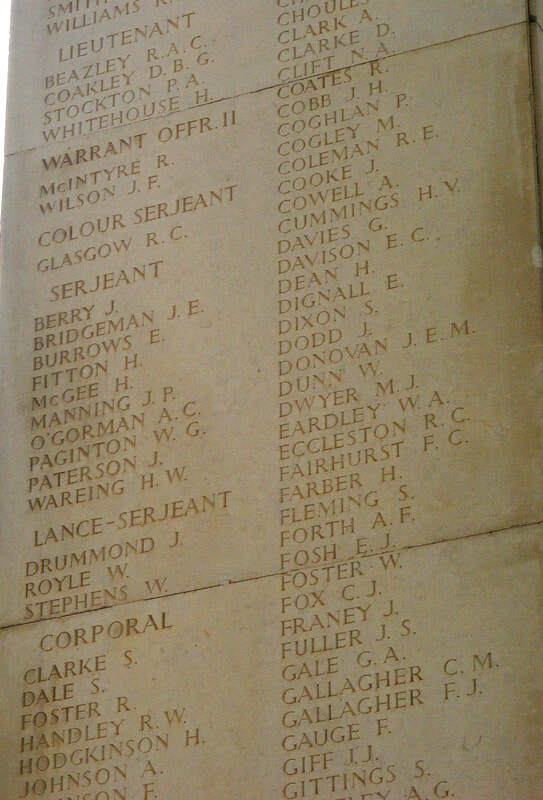 He is one of a few names I know here, the others died in Rangoon Jail, but I do not know all their numbers or regiment details. Signalman 6290071 Herbert Michael Belchier was the son of Thomas and Mary Belchier from Enfield in Middlesex. He had been a last minute reinforcement for Operation Longcloth, joining the 77th Indian Infantry Brigade on the 19th January 1943 as the unit moved down to Imphal in Assam. Herbert and around thirty other Signalmen were attached to Wingate's 77th Brigade from their temporary base at Jhansi and had previously taken part in clandestine operations in the Yunnan Provinces of China, possibly as part of the 204 Military Mission. Herbert was also lost when the Japanese opened fire upon Lieutenant Gordon's boat. Riflemen Orlando and Tunnion were from the Kachin Hill tribes of Burma. They were posted to Wingate's own Brigade Head Quarters in late autumn 1942, whilst the newly formed Chindits were training at Saugor in the Central Provinces of India. They were also in the ill-fated boat that attempted to cross the Irrawaddy on the 29th April. Both these Riflemen were captured by the Japanese that day and were eventually taken to the Maymyo Concentration Camp, where the enemy were collecting together all the Chindit prisoners of war. The two men worked as slave labour for their captors for a short period, before possibly being sent down to Rangoon Jail with the rest of the Chindit POW's. This is where their trail goes cold, but as no casualties by their names exist in CWGC records, it is a fair assumption that they survived their time in captivity and returned to their Kachin villages after liberation. 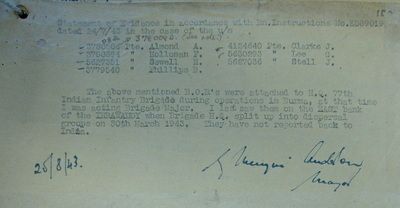 Jemadar 50009 Moody, 2nd Burma Rifles was also with Wingate's Brigade HQ on Operation Longcloth. In fact Moody was the Jemadar mentioned at the beginning of Lieutenant Wilding's letter as being wounded and captured by the Japanese whilst out on a recce of the riverside town of Inywa. Jemadar Moody was taken to the Maymyo POW Camp almost immediately after capture and spent several weeks there before managing to escape and return to India. On returning to his battalion, now based at Karachi, Jemadar Moody was sent to the hill stations of northern India for a period of rest and recuperation. In August 1943 the battalion war diary recorded his retrospective promotion to Subedar, a reward for his efforts on Longcloth and for escaping captivity at Maymyo. Pte. 3780694 Frederick Charles Holloman. Fred was born in the Wiltshire town of Salisbury, but grew up in the East End of London where his family ran a succession of public houses. Fred Holloman travelled to India with the original 13th Battalion of the King's Regiment aboard the troopship 'Oronsay' in December 1941. He was attached to Brigade Head Quarters where he performed the role of muleteer, looking after his mule, Betty, who carried the Brigade wireless set. After he was captured with Lieutenant Wilding's group on the 2nd May 1943, Fred was given the POW number of 350 inside Rangoon Jail. Fred survived his time in Rangoon and was liberated on the 29th April near the Burmese town of Pegu along with around 400 other prisoners of war. ​Pte. 3861856 Timothy Campbell. Born on the 27th December 1912 and formerly of the Loyal Regiment, Pte. Campbell was part of Captain Hosegood's Intelligence section on Operation Longcloth. In actual fact Tim Campbell, originally from Stockport in Lancashire was Hosegood's batman and served in this capacity throughout the expedition in 1943. He was captured, presumably at the Mynyaung Chaung on the 2nd May and spent just under two years inside Rangoon Jail with the POW number 354. Pte. 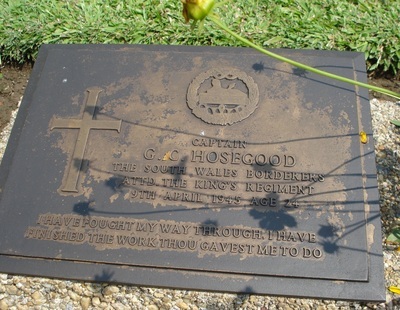 Campbell had the very sad duty of attending Captain Hosegood's funeral on the 9th April 1945 at the English Cantonment Cemetery. Timothy Campbell was liberated along with many of his Chindit comrades just three weeks later near the Burmese town of Pegu. Pte. 5620293 George Walter Lee. George Lee was with Wingate's Brigade Head Quarters on Operation Longloth. He was last seen during the ill fated attempted crossing of the Irrawaddy on the 30th March 1943, but was actually taken prisoner over one month later on the 2nd May. George survived his time in Rangoon Jail and was liberated near Pegu in early May 1945. It is true to say that George made every effort to inform Army authorities about the fate of men he had witnessed killed or taken prisoner. After the war he even wrote to several families, telling them what had happened to their loved ones. The next group of men, confirmed by written evidence as being part of Captain Hosegood's dispersal party came to light after the family of Pte. Leonard Coffin got in touch via my website contacts page. Leonard had kept a daily diary during his time in Burma, which he wrote on the back of some postcards. Very few of these cards survived his time as a prisoner of war in Rangoon, but those that did mentioned several more members of the dispersal party. Before we move on and identify these men, seen below are some photographs showing four of the soldiers mentioned previously in this listing. Please click on any image to bring it forward on the page. Pte. 5623121 Leonard Coffin. This man was a member of Northern Group Head Quarters on Operation Longcloth, which was the command centre for Columns 3, 4, 5, 7 and 8 within the 77th Indian Infantry Brigade and was led by Lieutenant-Colonel S.A. Cooke, formerly of the Lincolnshire Regiment. When the time came to return to India, Colonel Cooke decided to disperse with Column 8 and the two groups merged to form one large unit of approximately 400 personnel. However, Leonard Coffin did not go with them, teaming up instead with Captain Hosegood and the twenty five or so men in his dispersal party. After spending the best part of the next four weeks moving up and down the eastern banks of the Irrawaddy hoping to find a suitable crossing point, Hosegood and his men, by now totally exhausted, were forced to give themselves up to the Japanese. Leonard was taken prisoner near the Burmese village of Tigyaing on the 2nd May. He ended up spending the next two years as a prisoner of war inside Rangoon Central Jail, before his liberation in late April 1945 close to the Burmese town of Pegu. Here is what I know about some of the men mentioned in Leonard's diary and some of the other soldiers confirmed as members of his dispersal group in April 1943. Pte. Simons (sometimes referred to as Simmons). This man's identity has proved somewhat of a mystery. He is mentioned by both Leonard Coffin and Lieutenant Wilding as having gone missing whilst out searching for fresh water for the group in early April. He turned up again at the Maymyo POW Camp, but then drops off the radar once more. No one with the surname of Simons was held as a prisoner inside Rangoon Jail or was listed as a casualty for Operation Longcloth. 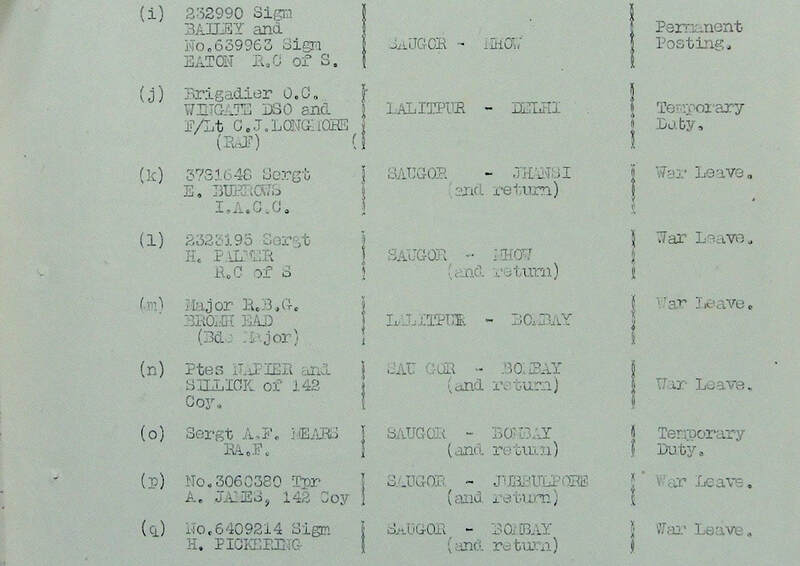 There was a man named William Symons formerly with 7 Column who perished as a POW in early June 1943, but it is difficult to see how he could have joined up with Captain Hosegood's dispersal team at the Irrawaddy although his dispersal party, led by Lieutenant Rex Walker were in the vicinity on the 10th April. Lance Corporal 3775117 Cecil William Mills. This soldier was from Chester and originally with the 14th Battalion of the King's Regiment before joining Chindit training in the summer of 1942. He was part of the 142 Commando platoon and had been attached to the Signals section of Brigade Head Quarters during Operation Longcloth. Cecil was captured alongside Captain Hosegood at the Mynyaung Chaung in early May 1943 and is listed as being killed on the 12th May. As mentioned in Leonard Coffin's diary, Cecil had been wounded even before he became a prisoner of war, and it is suggested from witness statements given by eventual survivors of Operation Longcloth, that he was murdered by the Japanese because he was too ill or disabled to travel with the rest of the group. One report states that the Japanese told another Chindit that Cecil had been 'taken to hospital.' He was never seen or heard of again. Signalman 3775126 Victor Foch Amos was the son of William and Elizabeth Amos from Ellesmere Port in Cheshire. He was a last minute addition to Wingate's Brigade HQ in January 1943, having previously served on covert missions in the Yunnan Province of China. Victor survived his initial period as a prisoner of war, but sadly perished inside Block 6 of Rangoon Jail on the 1st February 1944. His POW number was 550 and he was originally buried at the English Cantonment Cemetery, located close to the Royal Lakes in the eastern sector of the city. His grave reference for the Cantonment Cemetery was recorded as number 148. Pte. 4625974 Clifford W. Sillick. This man originally enlisted into the East Yorkshire Regiment at the beginning of WW2, before being posted to the 142 Commando section of the 77th Indian Infantry Brigade at the Chindit training camp of Saugor on the 30th September 1942. Clifford was attached to Wingate's Brigade Head Quarters on Operation Longcloth and was allocated to Captain Hosegood's dispersal group on the 30th March 1943, where he was responsible for the construction of the rafts built to ferry the group across the Irrawaddy River. 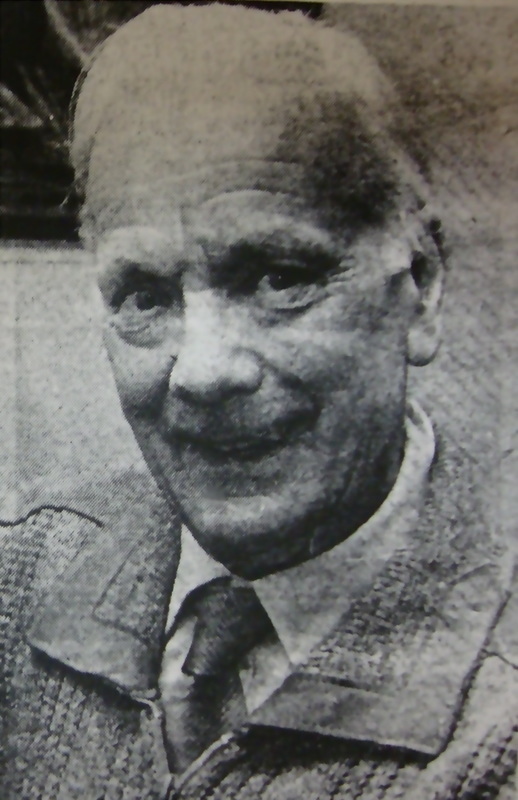 Clifford was reportedly an eye-witness to the death of Corporal Purdy on the 29th April, when Purdy and Lieutenant Gordon's party attempted to cross the river in a country boat. Pte. Sillick was captured on the 2nd May 1943, he survived his time as a prisoner of war and was liberated on the 29th April 1945 at the Burmese village of Waw close to the town of Pegu. Lance Corporal 6103385 James Arthur Willis was the son of William and Mary Willis and the husband of Isobel Willis from Slough in Berkshire. He was also a last minute reinforcement to 77th Brigade and had also been on active service in China prior to joining Wingate's Brigade HQ in January 1943. James was the Head Quarters wireless operator on Operation Longcloth and was allocated to the dispersal group led by Captain Hosegood and Lieutenant Wilding on the 30th March. By the time of his capture on the 2nd May, James was the only Chindit in the dispersal group still in possession of a serviceable rifle. No rifle oil had been dropped to the Chindits during their time behind enemy lines, but James with no little ingenuity had used his allocation of mosquito repellent cream to keep his weapon in good order. Alas, one rifle was never going to be enough to fend off the advancing enemy patrol and eventually Wilding decided to surrender and his group fell into Japanese hands. James Willis died in Block 6 of Rangoon Jail on the 11th September 1943 and was buried alongside his comrades at the English Cantonment Cemetery. 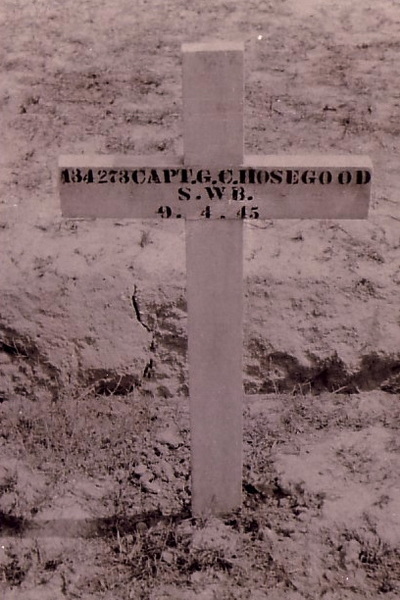 His POW number whilst inside Rangoon was 557 and his grave reference in the Cantonment Cemetery was recorded as 73. After the war was over, all the POW burials from Rangoon Jail were removed from their original resting place and re-interred at the newly constructed Rangoon War Cemetery. Pte. 3780156 George Needham was the son of George and Alice Needham and the husband of Alice Needham from Leigh in Lancashire. Originally a cook in the 13th Battalion, George moved across to 142 Commando in the summer of 1942 and was attached to Wingate's Brigade Head Quarters. Pte. Needham was captured with Captain Hosegood at the Mynyaung Chaung in early May 1943. From witness statements given by survivors of Operation Longcloth, it would appear that George suffered a similar fate to that of Cecil Mills. Pte. James Dixon, also of 142 Commando stated that: I think that he was shot by the Japanese because no medical facilities were available when they moved us on. George died on the 12th May. 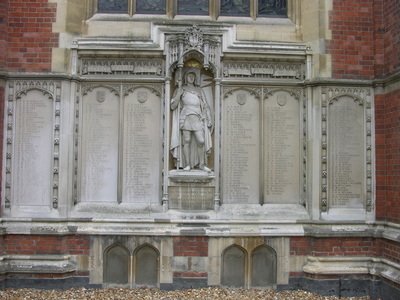 His grave was never recovered after the war and so he is remembered upon Face 5 of the Rangoon Memorial along with Cecil Mills. Pte. 5338529 George Arthur Eales. Formerly of the Royal Berkshire Regiment, George became a member of the Brigade Head Quarters Commando platoon in September 1942. Born on the 27th August 1919, he was the son of Henry Michael and Amy Elizabeth Eales from Cricklewood in London. Captured on the 11th May 1943, George sadly perished from the effects of beri beri inside Rangoon Jail on the 26th June 1944. His POW number was 366 and his grave reference in the English Cantonment Cemetery was recorded as 189. Pte. 4467646 James Dixon. Born on the 2nd December 1910 and formerly of the Durham Light Infantry, James, also a Commando, was posted to Captain Hosegood's Intelligence section in Wingate's Brigade HQ. He was captured on the 11th May 1943 at the Mynyaung Chaung and spent just under two years inside Rangoon Jail with the POW number 369. James was liberated in late April 1945 at Pegu. 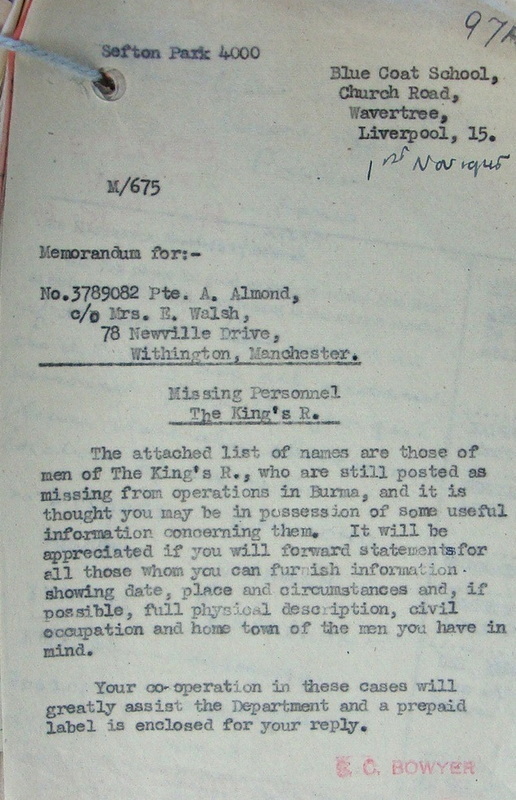 Amongst the listings in the missing in action files for the 13th King's (National Archives reference WO361/442) there were three separate pages showing various mixes of the above mentioned men plus others. These three pages can be seen in the gallery below. It is more than likely, although at present impossible to confirm that some, if not all of the men listed here were with Captain Hosegood and Lieutenant Wilding at the Irrawaddy. NB. 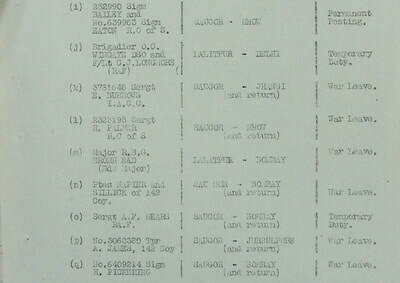 At least two of these lists were compiled by Wingate's Brigade-Major in 1943, namely Gilmour Menzies-Anderson. Please click on any image to bring it forward on the page. Pte. 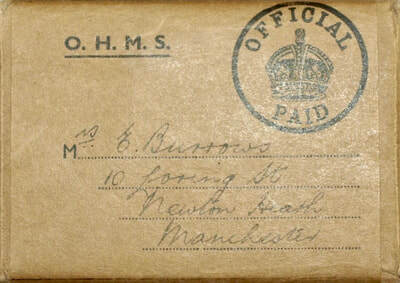 3780027 Frank Berkovitch was tailor in civilian life and travelled to India with the original 13th Battalion of the King's Regiment aboard the troopship 'Oronsay' in December 1941. It has never been possible to confirm which Chindit column Frank belonged to, although evidence does support his membership of Captain Hosegood's dispersal party. Sergeant 2986215 James Masterton MM was serving with A company 2nd Battalion Argyll and Sutherland Highlanders in Malaya just before the fall of Singapore in 1942. He was one of the very few soldiers to successfully escape Singapore by boat and make it back to India in one piece. 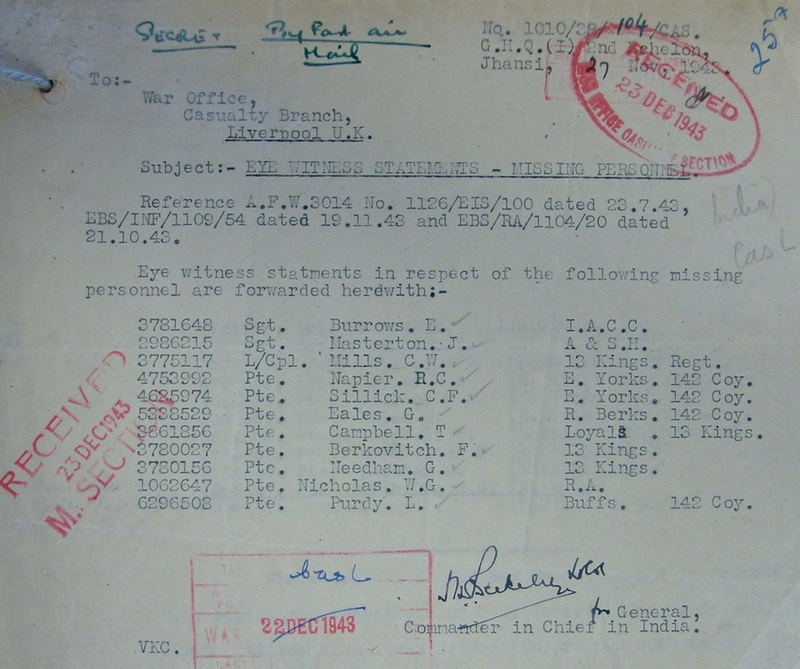 Finding himself without a unit, James, known to his comrades as 'Jock' must have heard about Wingate's fledgling Chindit Brigade and decided to join up with 77th Indian Infantry Brigade, where he became Lieutenant Wilding's Cipher Sergeant. Bombardier 1062647 William George Nicholas was the son of John and Hannah Nicholas and husband of Megan Nicholas from Bedlinog in Glamorgan. William was listed as missing at the Irrawaddy and became a POW, although no documents survive that can confirm his capture in 1943, he was recorded as having being held at the Maymyo Camp before the move down to Rangoon. Sadly, William perished inside Block 6 of Rangoon Jail on the 4th February 1944 and was buried at the English Cantonment Cemetery. His POW number was 411. Sergeant 3781648 Edward Burrows was the son of Tom and Edith Burrows and the husband of Eunice Burrows from Swinton in Lancashire. Edward was attached to Wingate's HQ from his original role in the Indian Army Corps of Clerks, taking up a position in the Head Quarter's Commando Section. He was last seen at the Irrawaddy on the 30th March 1943, but was recorded by the CWGC as being killed in action between the 31st March and the 24th April that year. Pte. 4753992 Ronald Charles Napier was the son of William George and Daisy Napier and husband of Mabel Napier from Greenwich in London. Formerly of the East Yorkshire Regiment, Ronald became part of the 142 Commando in 1942 during Chindit training, eventually taking up a place in Graham Hosegood's Intelligence Section on Operation Longcloth. Ronald was last seen on the eastern banks of the Irrawaddy River on the 30th April 1943. He became a prisoner of war soon afterwards and was given the POW number 492. He sadly died in Block 6 of Rangoon Jail and was buried at the English Cantonment Cemetery on the 31st December 1943. Pte. 5627351 Harry Henry Sewell was formerly with the Devonshire Regiment; this soldier was last seen by Brigade-Major Menzies Anderson on 30th March 1943. He was a member of Wingate's Brigade Head Quarters and formed part of a dispersal group from that section in early April that year. At some point thereafter he became a prisoner of war and died in Rangoon Jail on 30th April 1945, just a few short days before many of his comrades were liberated. His POW number was 555. Pte. 3780082 Arthur Almond travelled to India with the original 13th Battalion of the King's Regiment aboard the troopship 'Oronsay' in December 1941. He was posted to Wingate's Brigade Head Quarters on Operation Longcloth and was last seen on the eastern banks of the Irrawaddy on the 30th March 1943. 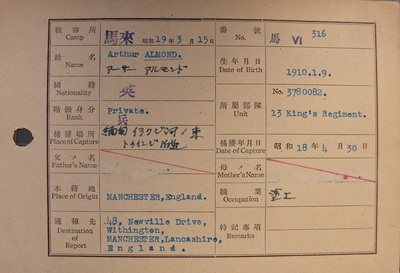 Arthur was captured by the Japanese on the 30th April, close to the Burmese village of Twinnge and was eventually transported to Rangoon Jail where he was given the POW number 316. Pte. Almond was liberated with some of his Chindit colleagues near the Burmese town of Pegu on the 29th April 1945. ​On his return to the United Kingdom he assisted the Army Investigation Bureau based at the Blue Coat School, Wavertree in Liverpool, by giving information about many of the men missing and lost on the first Chindit expedition. 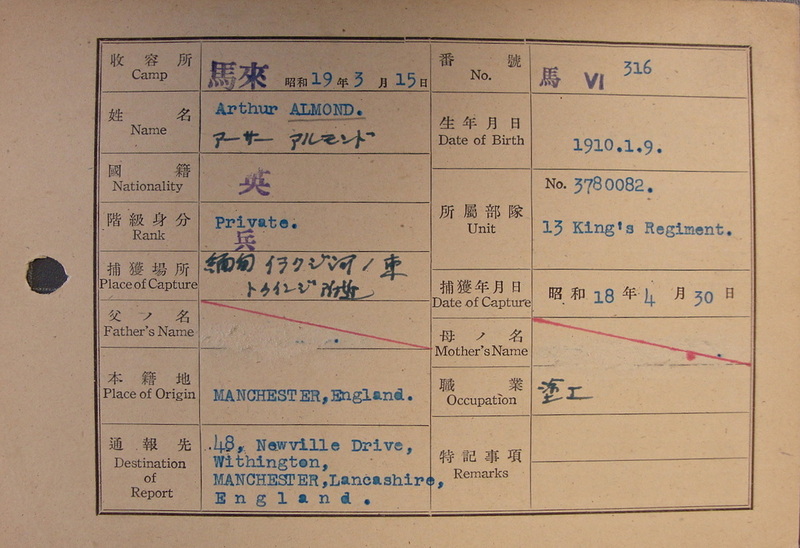 From the various documents detailing Arthur's time in Burma, his Army service number is sometimes recorded as 3789082 as opposed to 3780082. Please see the update below for more family related details. Pte. 4124640 James Alfred Clarke was the son of Robert and Emma Clarke from Wallasey in Cheshire. His Army service number suggests that James first enlisted into his hometown unit, the Cheshire Regiment. Like so many others, he was reported missing on the eastern banks of the Irrawaddy River on the 30th March 1943, whilst serving with Brigade Head Quarters. James perished in Block 6 of Rangoon Jail on the 21st February 1944 and was buried at the English Cantonment Cemetery. His POW number was 611. ​Pte. 3779540 Bert George Richard Phillips was the son of Bertie and Norah Phillips from Liverpool. Another member of Wingate's Brigade HQ and last seen at the Irrawaddy on the 30th March, Bert Phillips died inside Block 6 of Rangoon Jail on the 10th August 1943 and was buried in the English Cantonment Cemetery. His POW number was 551. It is unlikely that we will ever be absolutely sure whether some of these men were indeed with Hosegood and Wilding in April 1943. However, some written evidence does exist to support this proposition and that combined with educated guesswork and pure gut instinct leads me to believe that they were. ​Thank you so much for your wonderful website which has settled a family argument that has been running now for over 40 years, maybe even longer. 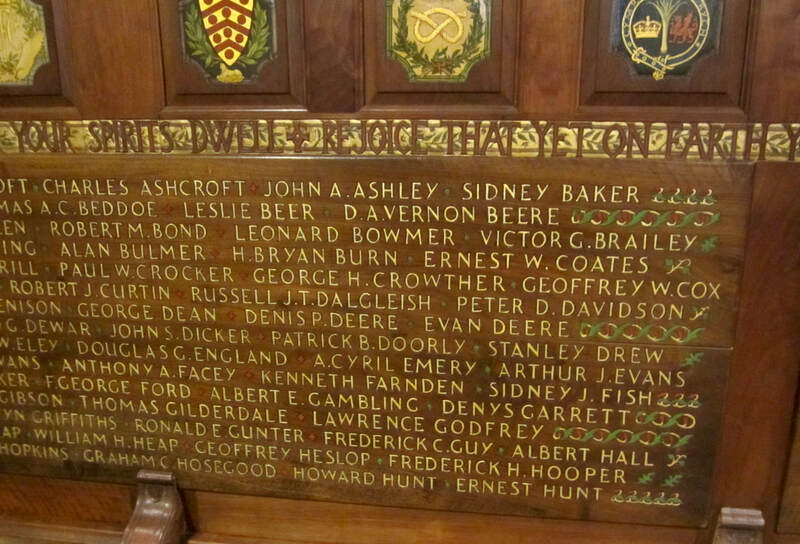 I am the great niece of Private Arthur Almond, whom I see from your website was captured with Graham Hosegood. Uncle Arthur died in 1973 or 1974 at about the age of 65. Sadly, he had only just retired and died of bowel cancer which may have been in part due to what happened to him in Rangoon Jail. I was about 14 when he died. I saw him all the time because after the war he came to live with my own Gran, who was his sister. My Gran was a widow and lived with her two children one of whom was my father, in a council house in Burnage an area to the south of Manchester city centre. We stayed there a lot at weekends, but Uncle Arthur rarely spoke to us other than when he came downstairs to go out in the morning, when he would say "morning" and exactly the same when he came back in the evening. Otherwise he used to remain in his room only venturing downstairs to eat in the kitchen or use the toilet. My cousins and I were told he had been a Japanese POW and that his fingernails had been pulled out because he was a Signaller and Radio Operator. I am afraid to say that we spent all our time trying to catch a glimpse of these and indeed they were jagged stumps of nails. However, he did become a "parky" after the war and this would have been hard on his hands too. At Christmas, when he came to our house , he would speak a little and we remember him saying after a few drinks, that the mules were the heroes in Burma. My Aunt recalls him saying that he survived being a prisoner of war because he came from a very poor family and hadn't been used to eating much food anyway, and it was those who thought of pork chops and were used to lots of food who found it hard and sometimes perished. We were all aware that he had been captured and that he had said he was a Chindit. He also said he was attached to Ord Wingate's group too. That was pretty much all we ever knew. My mother always believed that he couldn't have been a Chindit, because he was too small and not tough enough. Well your website has proved that he clearly was extremely tough and that he was indeed a Chindit. Sadly, his experience as a POW resonated throughout the rest of his life. He was a very solitary figure and tended to hoard everything he found during his workdays at the park, storing everything in his very small room at home. When he died my father found his demob suit and some old bully beef in his wardrobe, along with many other odd items. He was clearly suffering from what we now know as PTSD, but of course there was no help on offer back then. The only other thing I remember is reading a beautifully written letter to my Gran which Arthur had sent home from India. He was a short man, with a slim wiry build and very quick when he walked. We now know he was a very tough man, I feel so proud him. Learning more about Uncle Arthur, has made me realise what a saint my Gran was too. How typical of her to take in and look after her step-brother after his terrible experiences in WW2. Thank you so much for what you have done in ensuring these men are remembered. 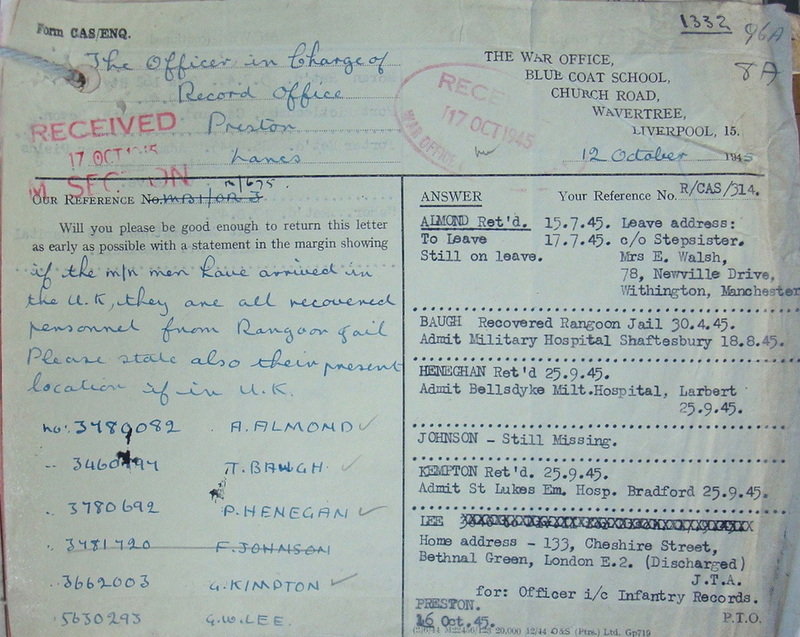 After the war, Arthur Almond assisted the Army Investigation Bureau in their attempt to discover what had happened to other casualties from the first Wingate expedition. This included a witness statement, where he listed the other men with whom he had shared his time as a prisoner of war. Seen below is a gallery of images in relation to Pte. Almond, including these witness statement documents. Please click on any image to bring it forward on the page. I would like to take this opportunity to thank Jo Walsh for all her help in bringing the story of her Uncle Arthur to these website pages. 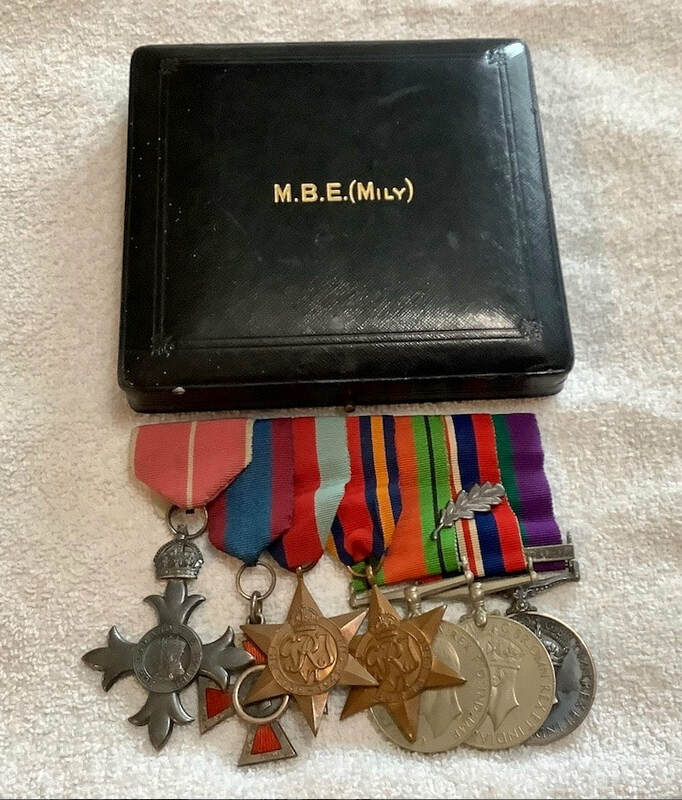 The medals of Sergeant Edward Burrows came up for sale on eBay on the 12th April 2018. The group consisted of: the 1939-45 Star, Burma Star, Defence Medal and War Medal. 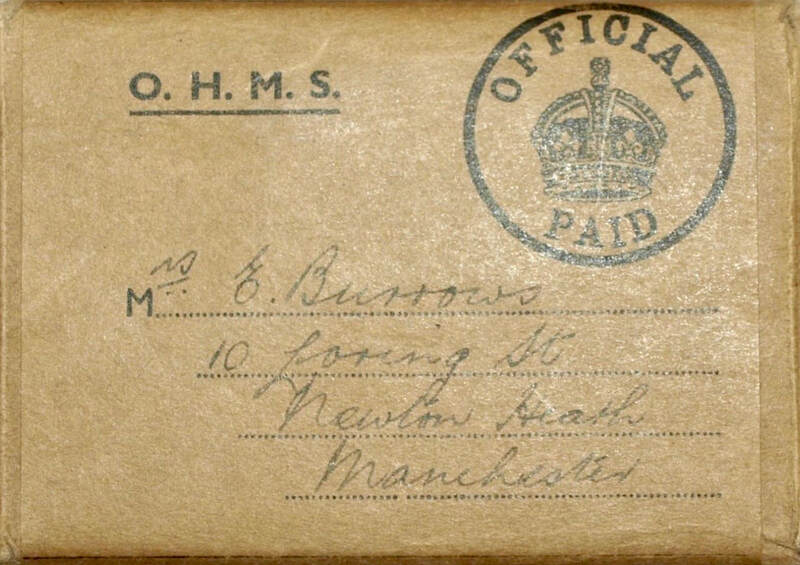 The box of issue was sent by the Infantry Records Office, Preston and was addressed to Mrs. E. Burrows of 10 Loring Street, Newton Heath, Manchester. Sadly, no condolence slip was present with the group and for that reason I did not bid on the auction myself. The medals eventually sold for £122.09, plus postage and packaging charges. 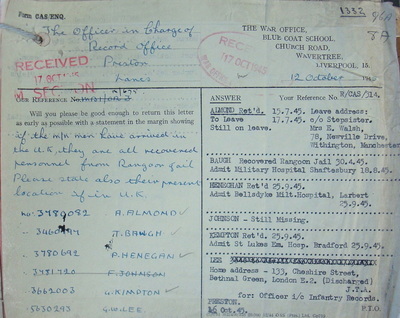 Seen below are some images in relation to Edward Burrows, including a notification of his war leave in November 1942 when he was part of 142 Commando based at Saugor. Please click on any image to bring it forward on the page. Copyright © Steve Fogden and Elizabeth Hosegood 2011/15.